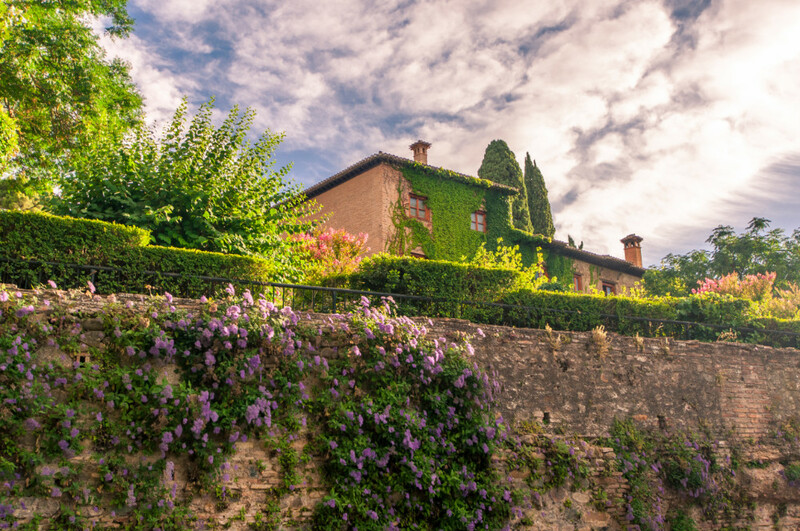 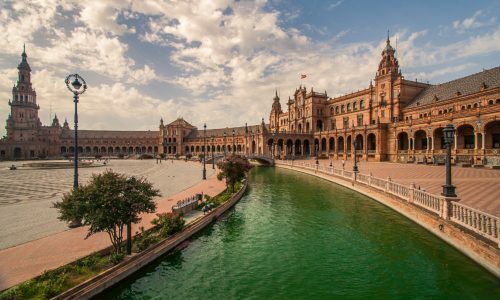 There are many reasons why Spain is one of the top destinations for tourists traveling around Europe. 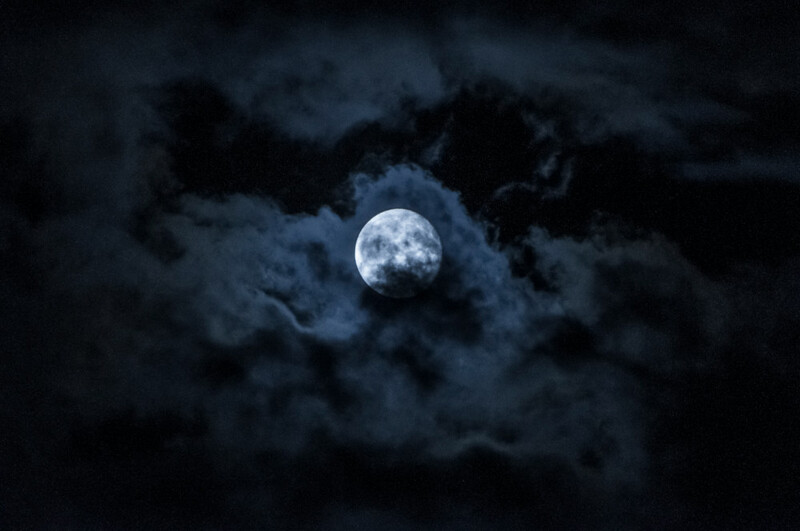 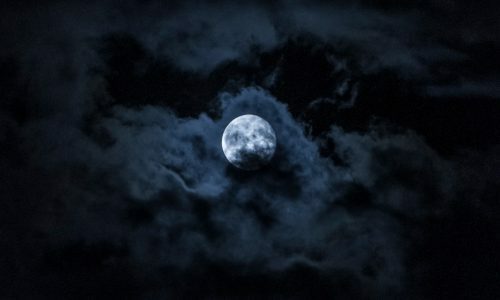 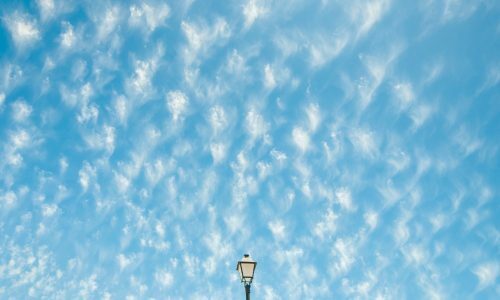 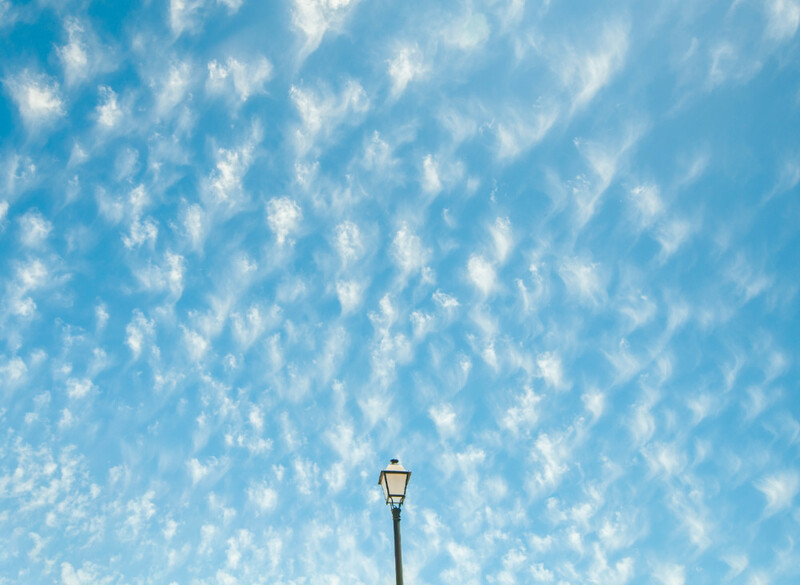 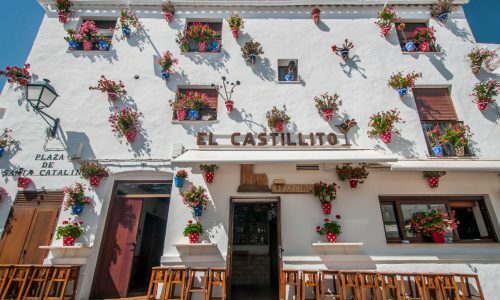 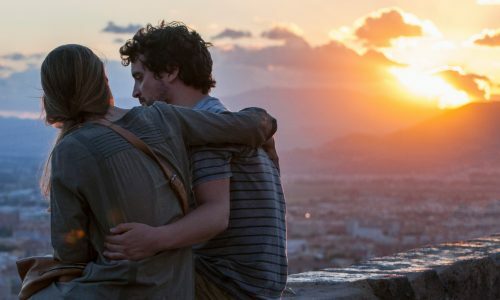 The weather is great pretty much all year-round (although it does get really hot in the summer), the food is to die for, the locals are fun, open-minded and beautiful, the nightlife is brilliant (I was in Madrid during the 2017 World Pride and can confirm that Spanish people know how to throw a party!) 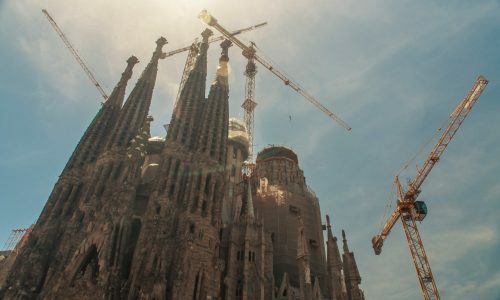 and it is way cheaper than most places in Western Europe. 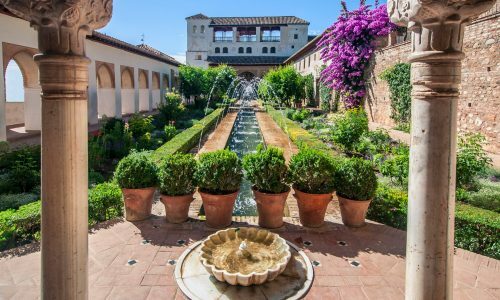 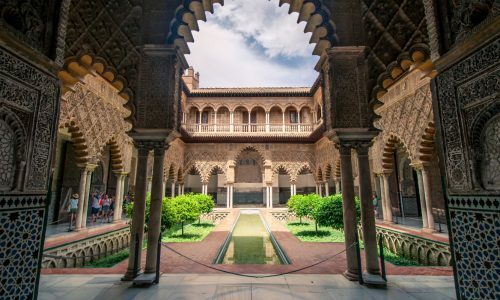 It may be difficult to escape the crowds if you stick around the more traditional itinerary (Barcelona, Madrid, Granada, Sevilla, etc. 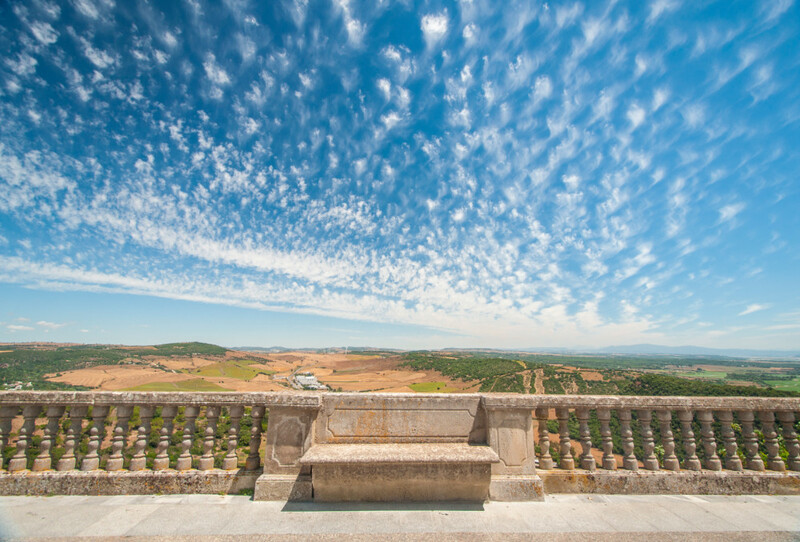 ), but there’s Portugal next door if you need some quieter time. 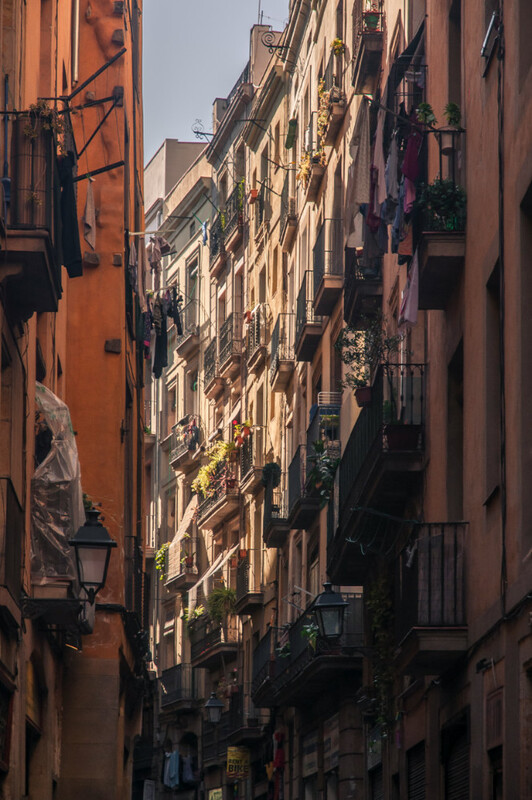 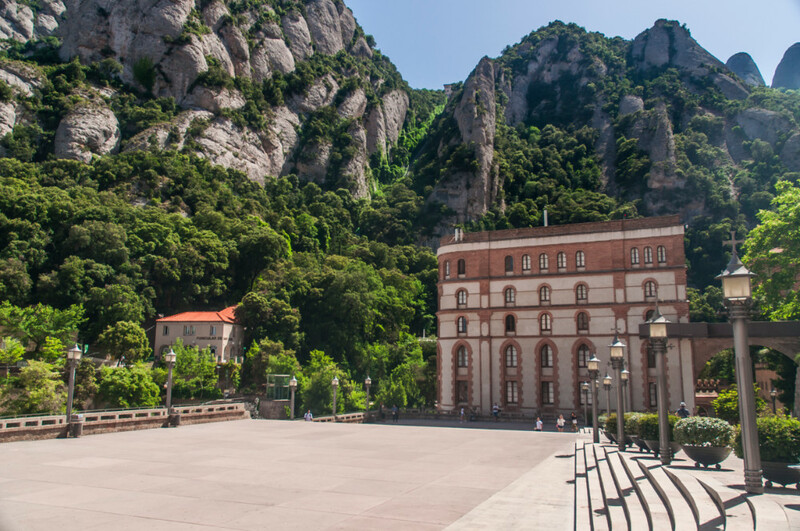 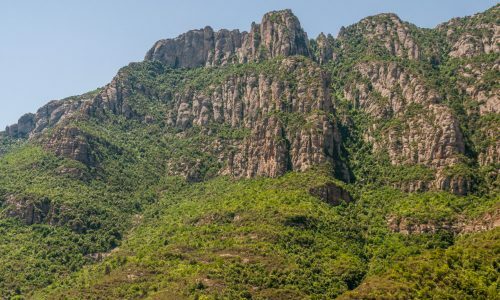 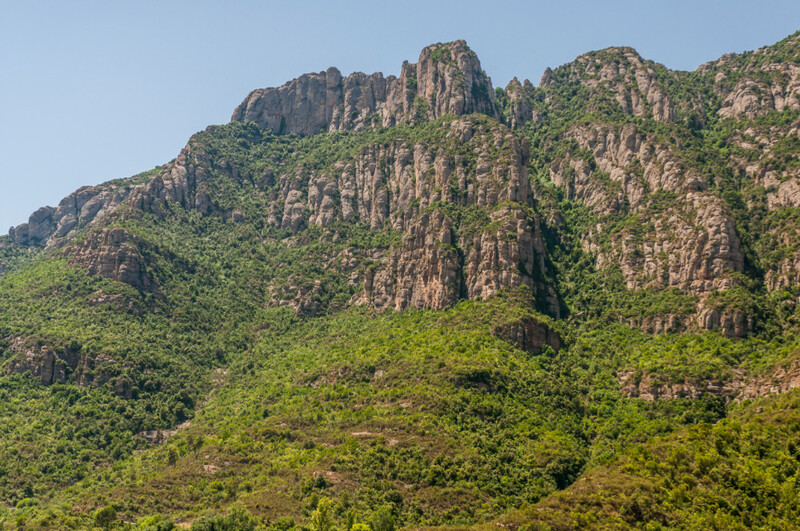 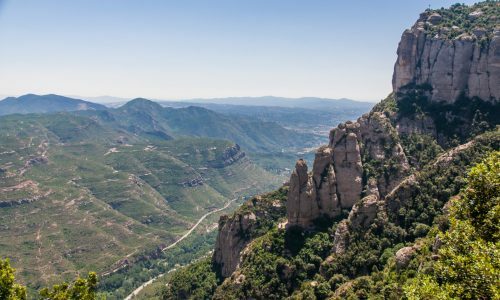 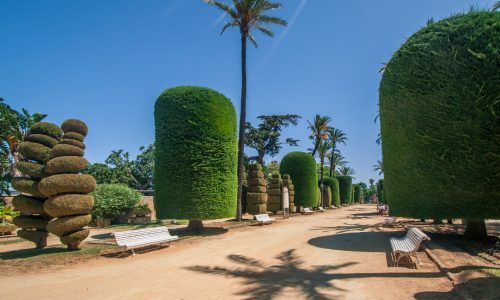 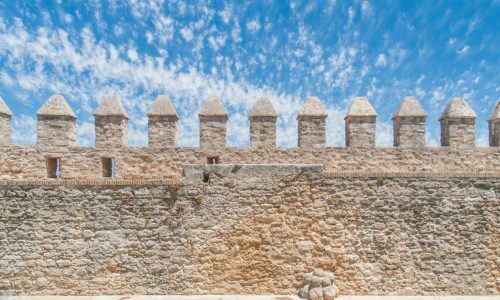 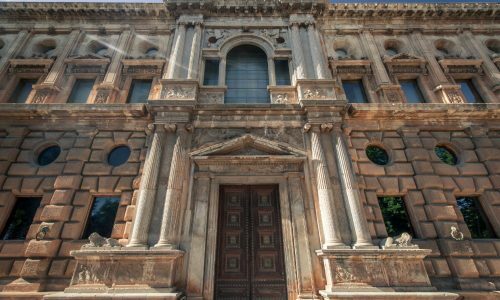 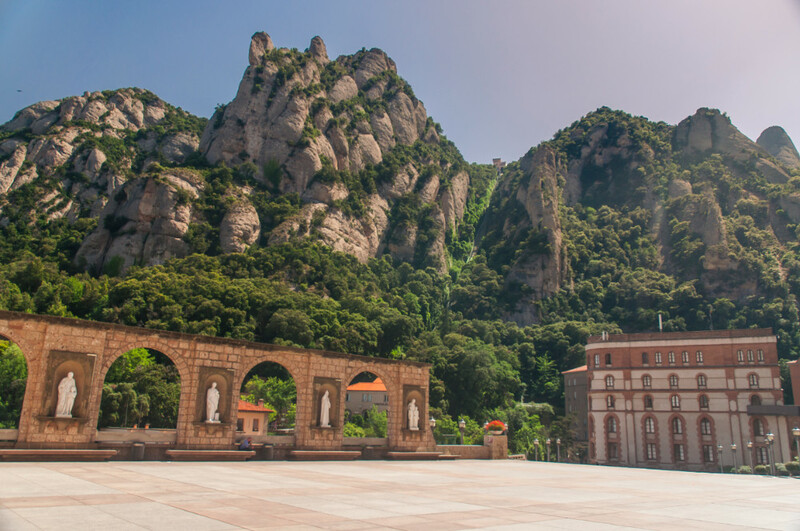 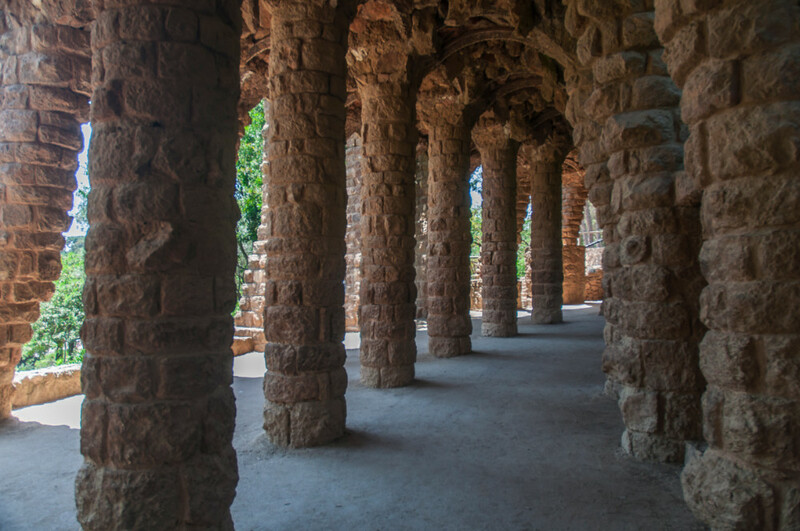 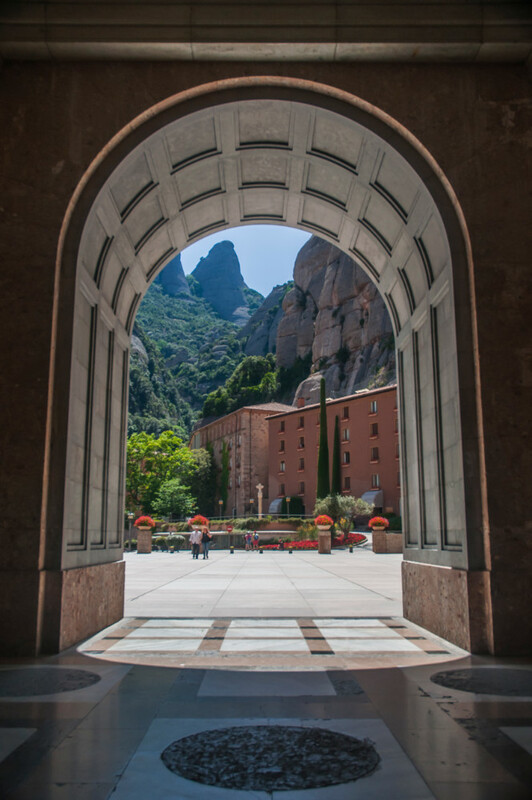 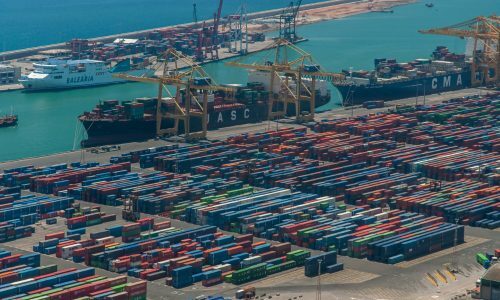 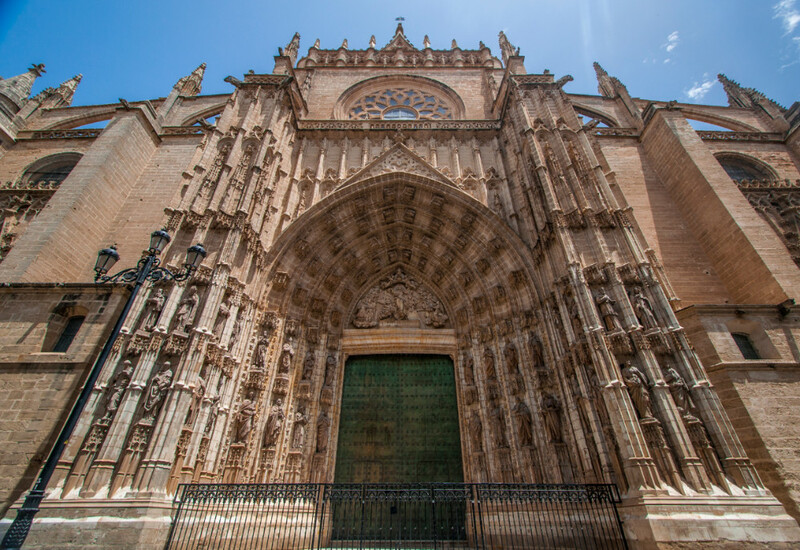 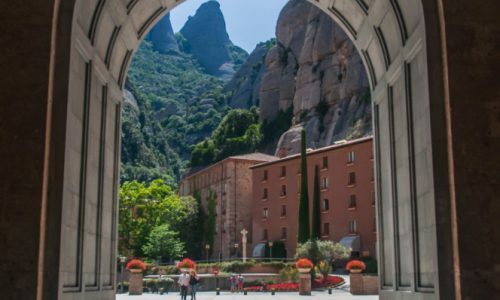 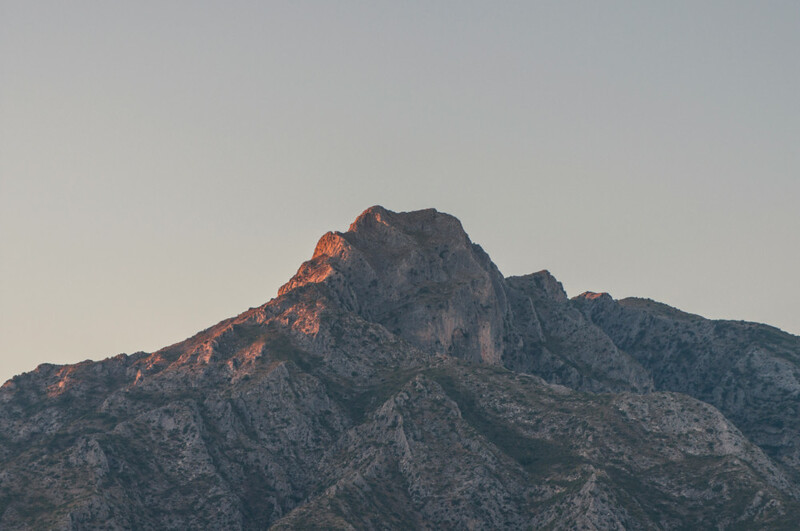 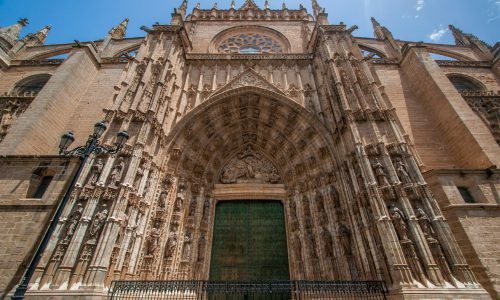 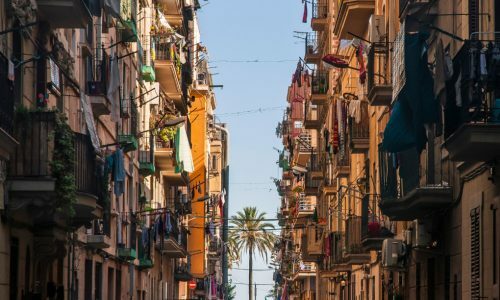 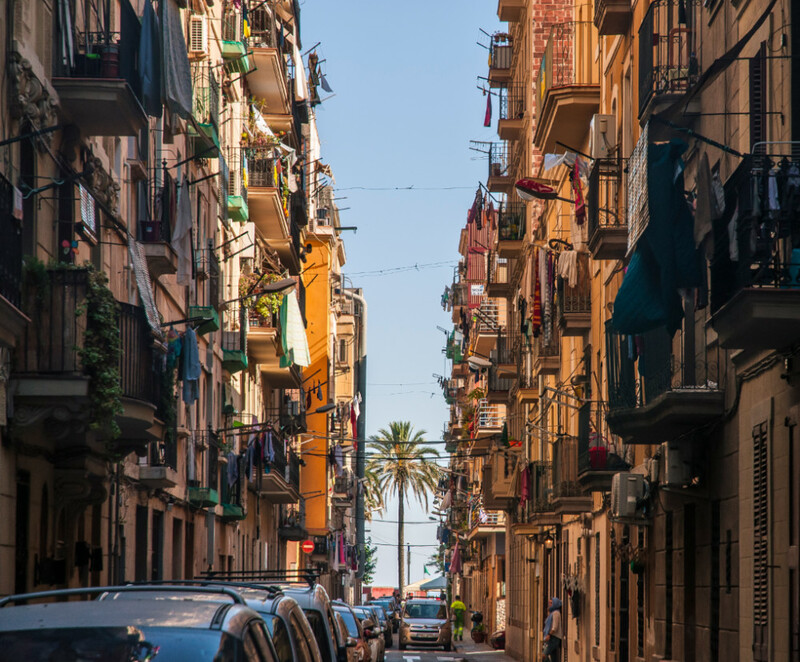 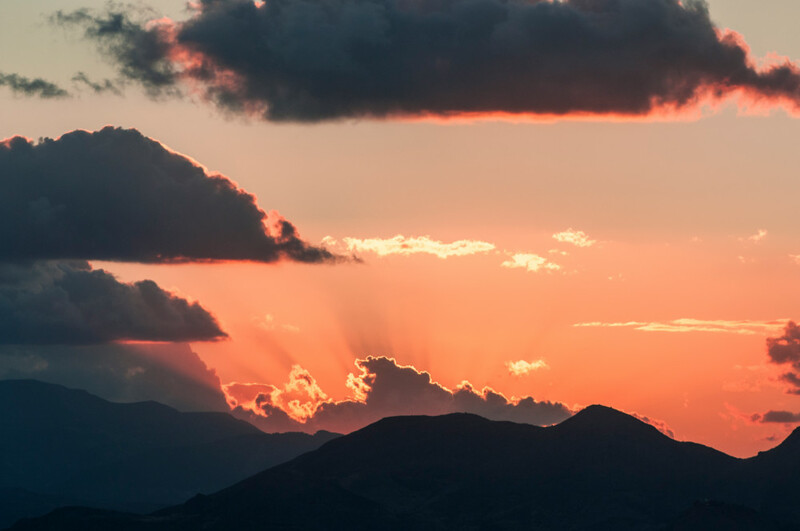 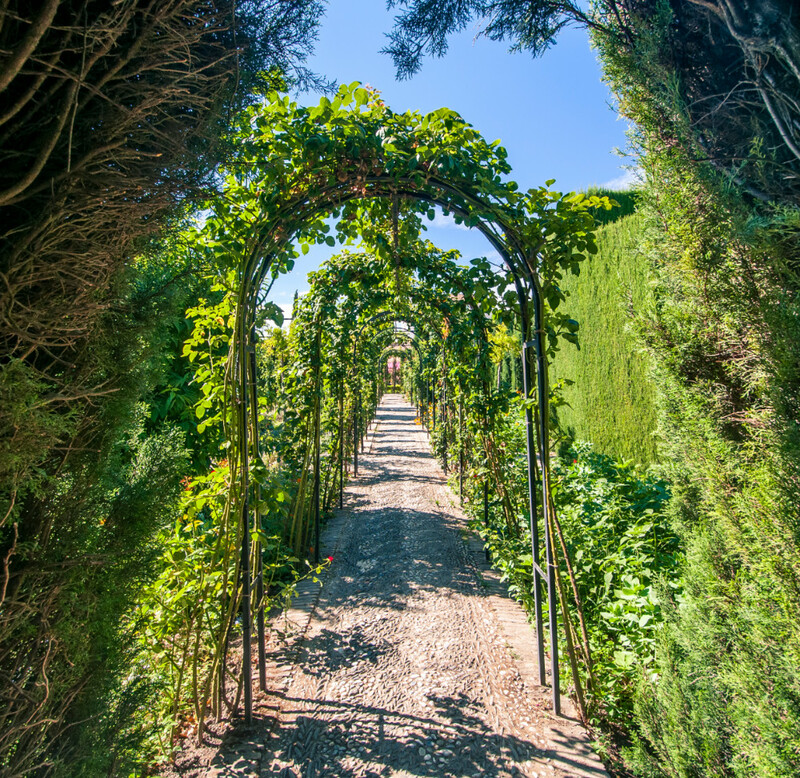 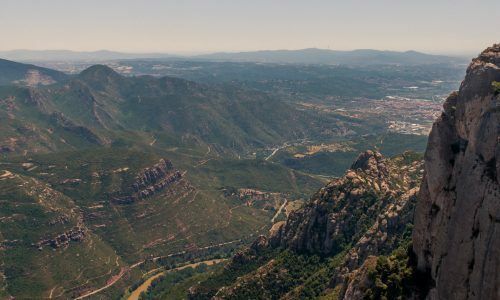 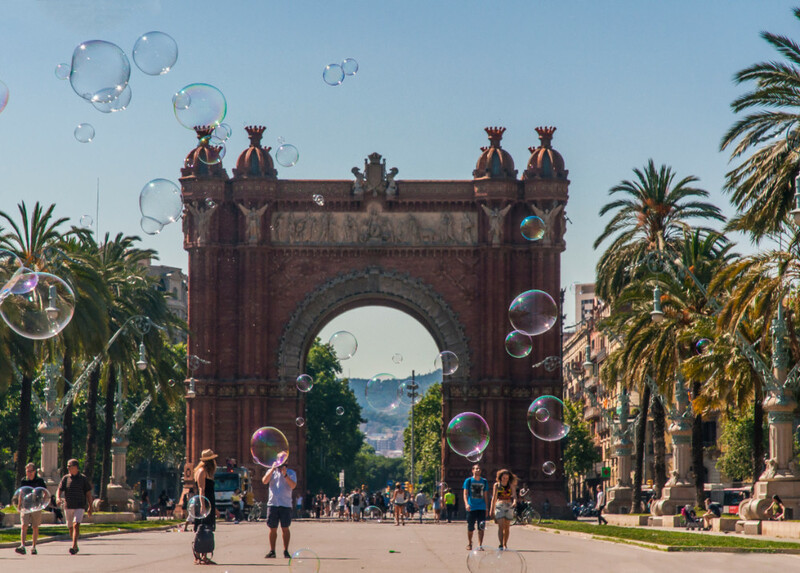 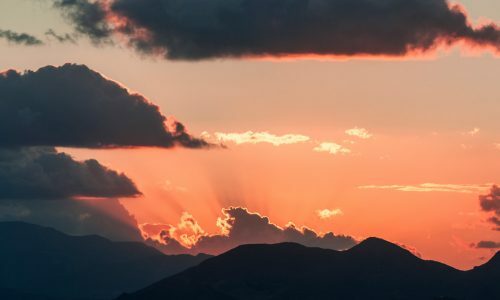 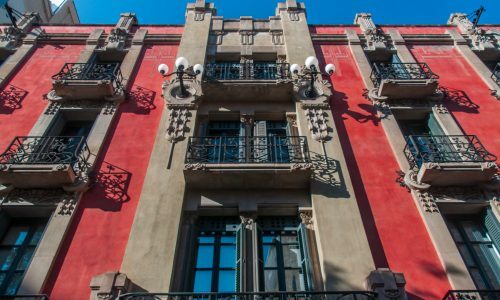 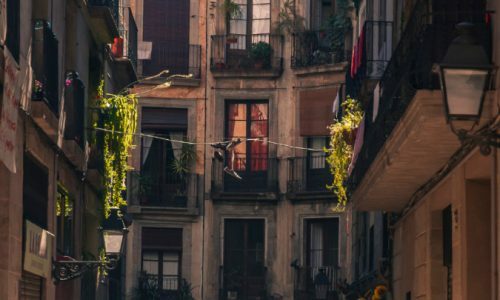 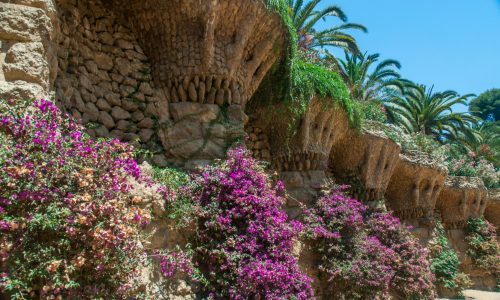 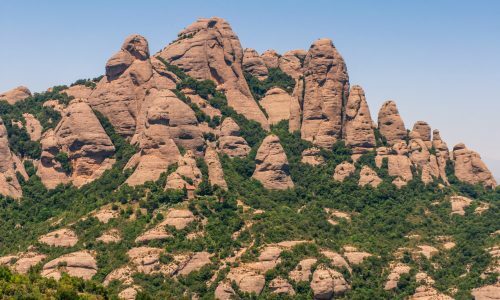 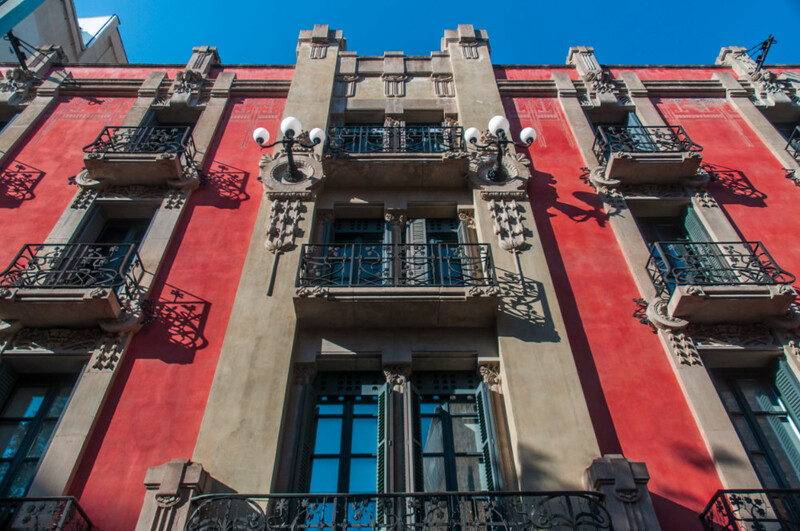 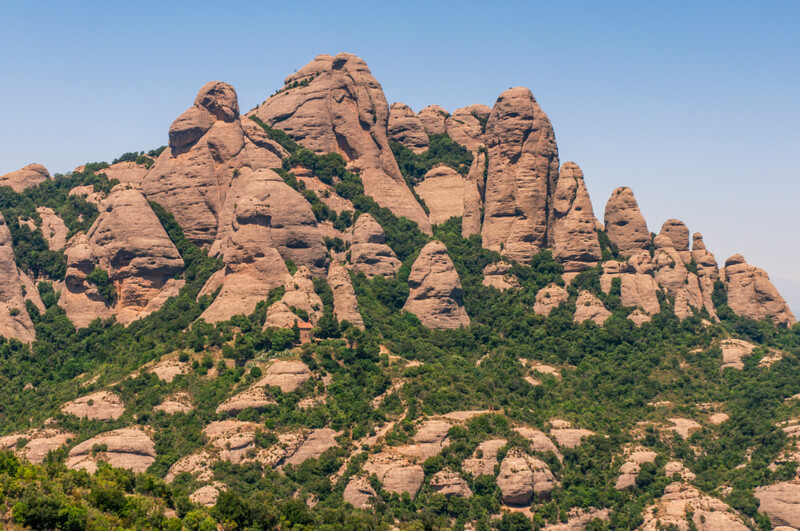 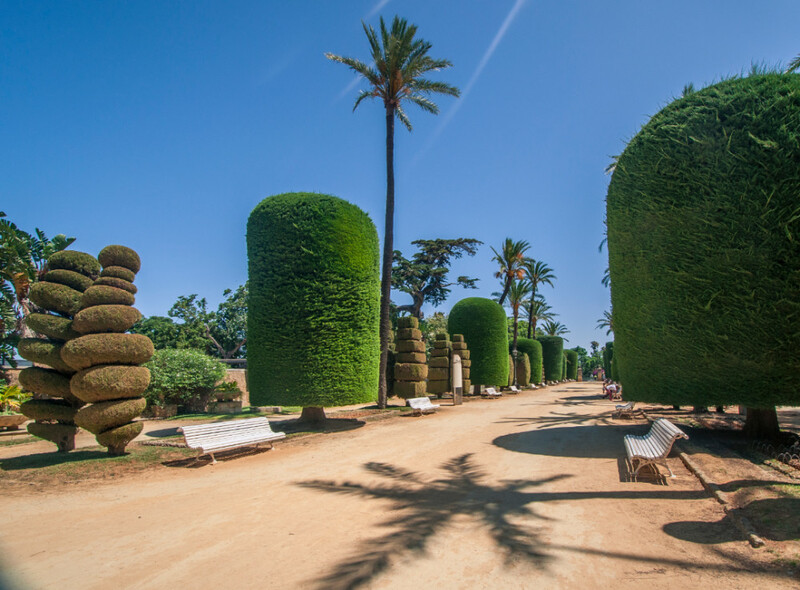 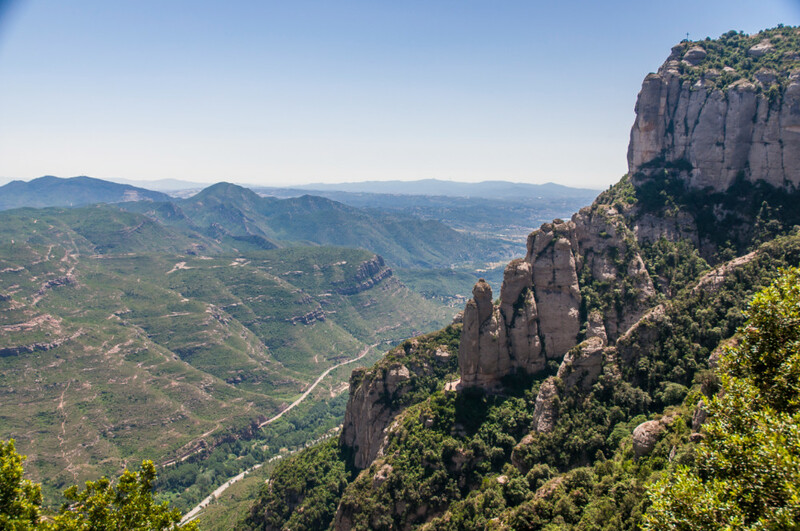 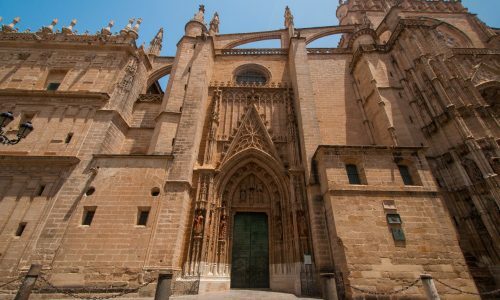 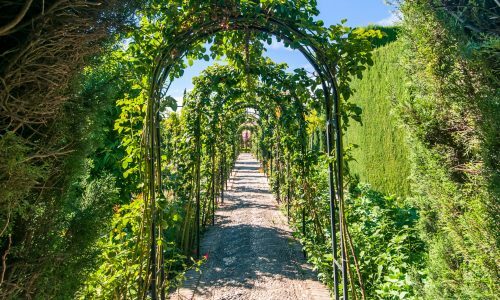 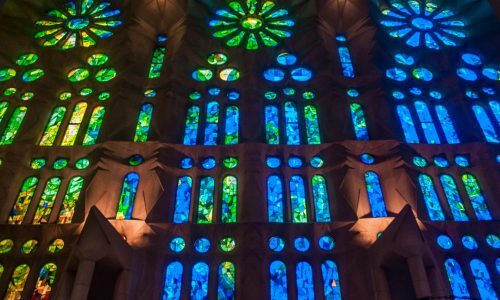 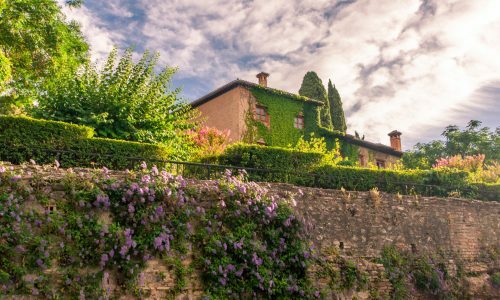 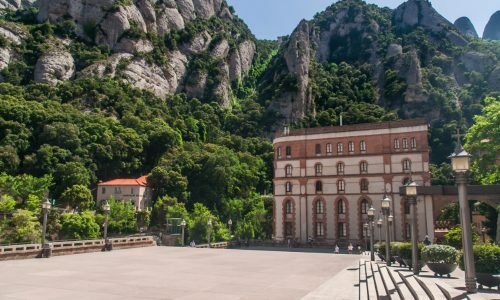 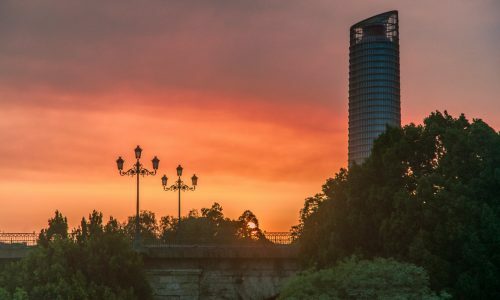 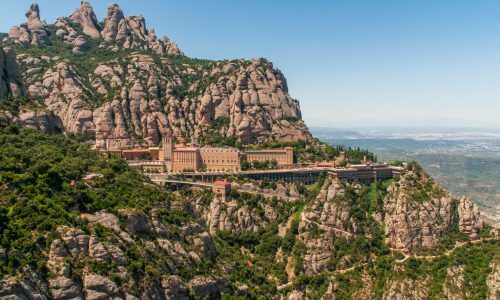 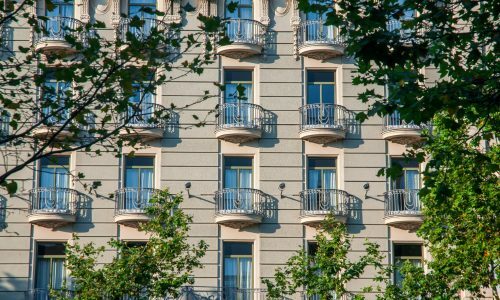 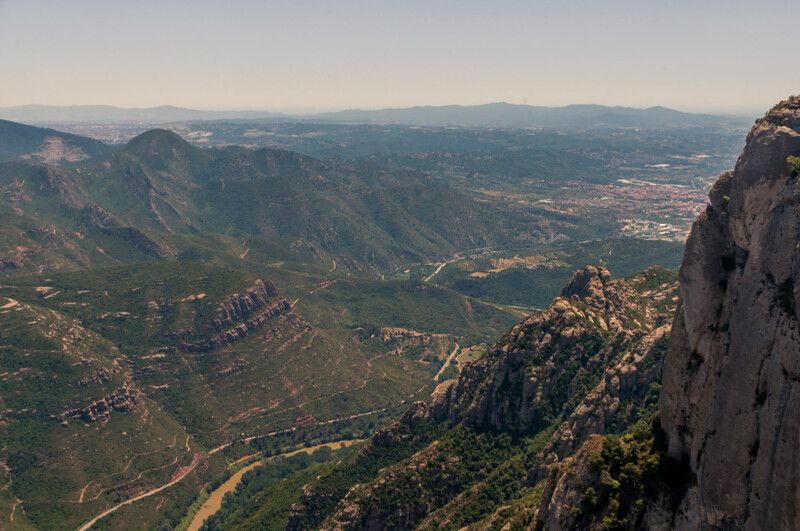 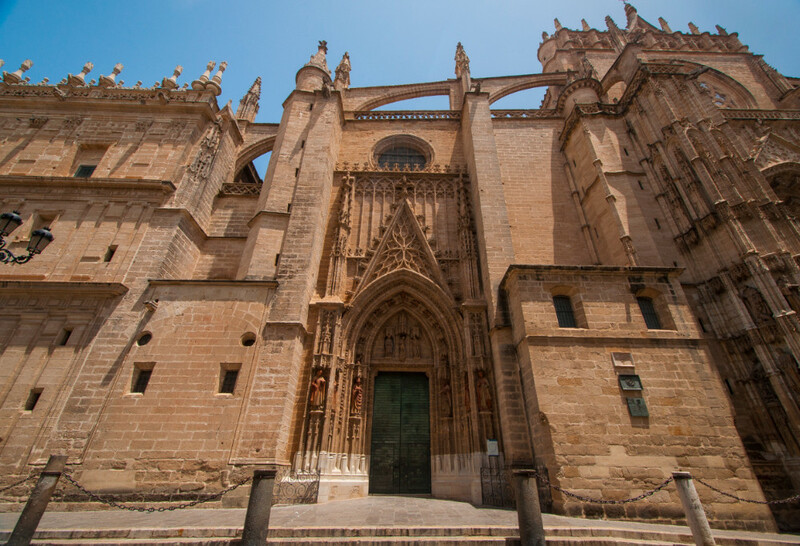 Deciding where to go in Spain can be difficult if you have limited time, but don’t forget that there is much more to see there than Barcelona! 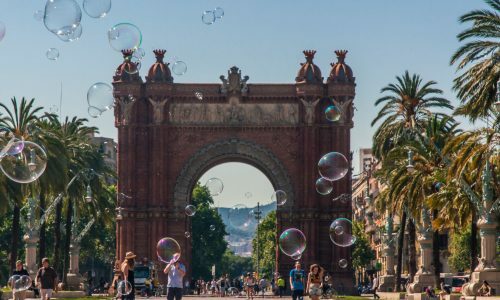 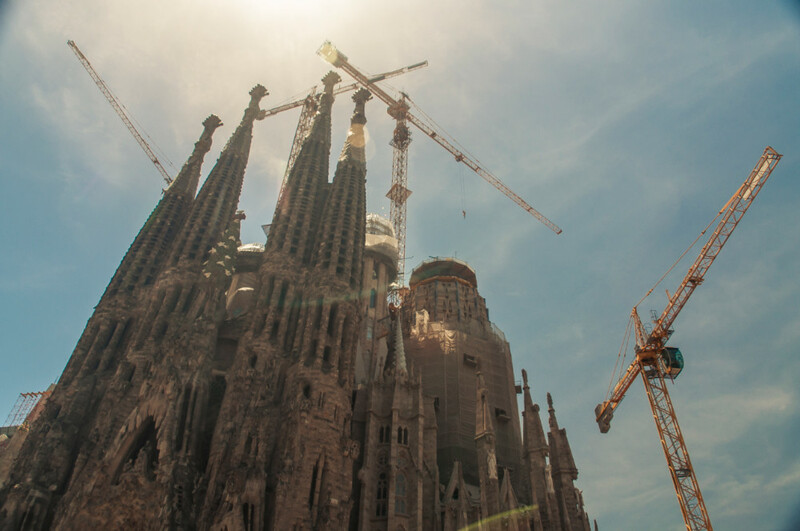 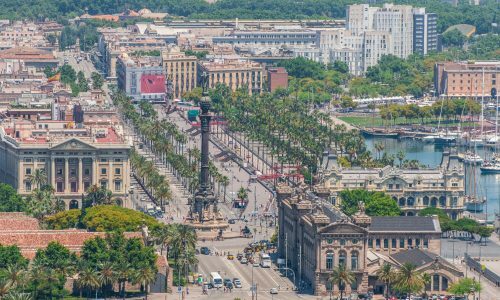 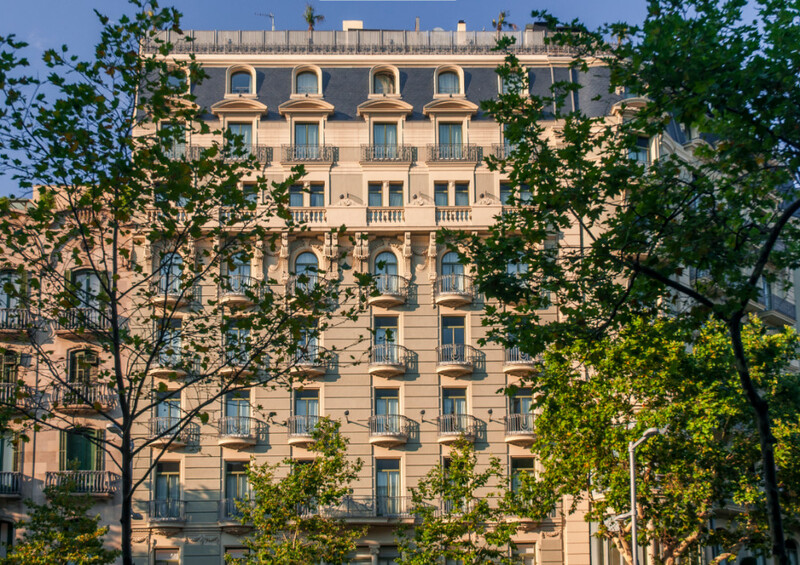 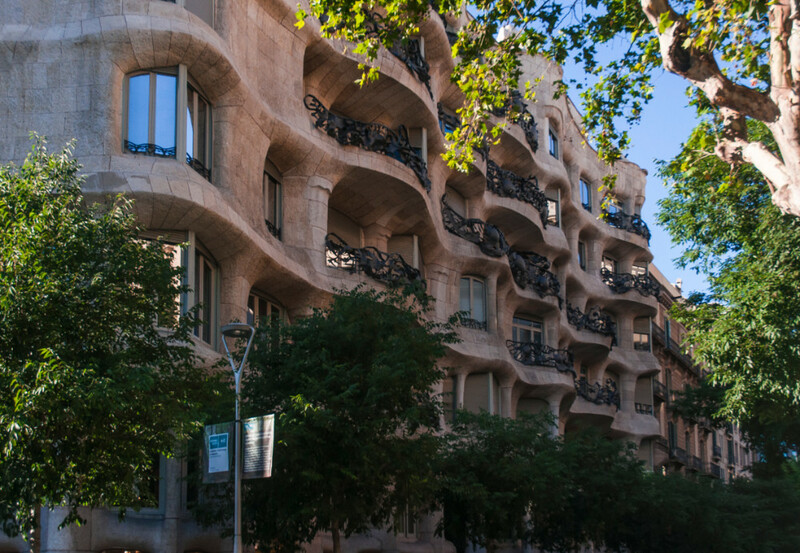 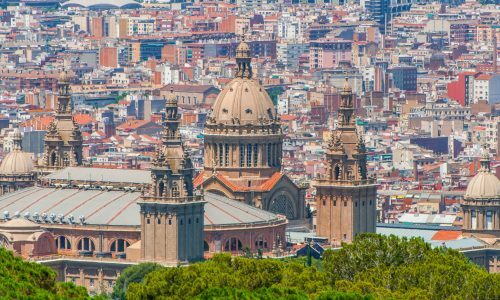 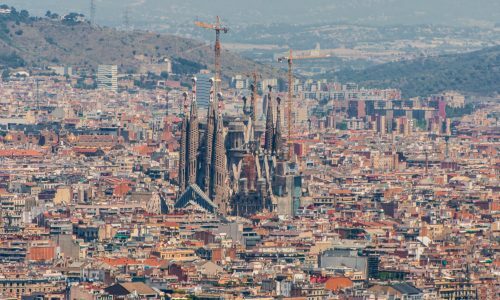 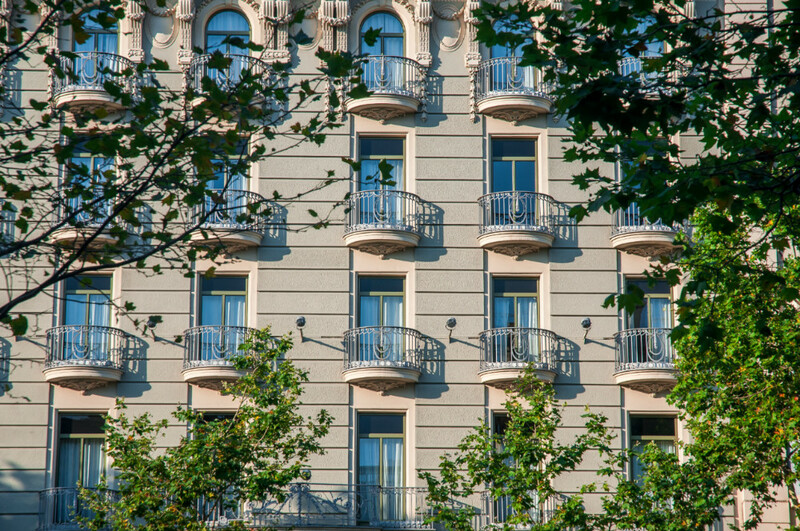 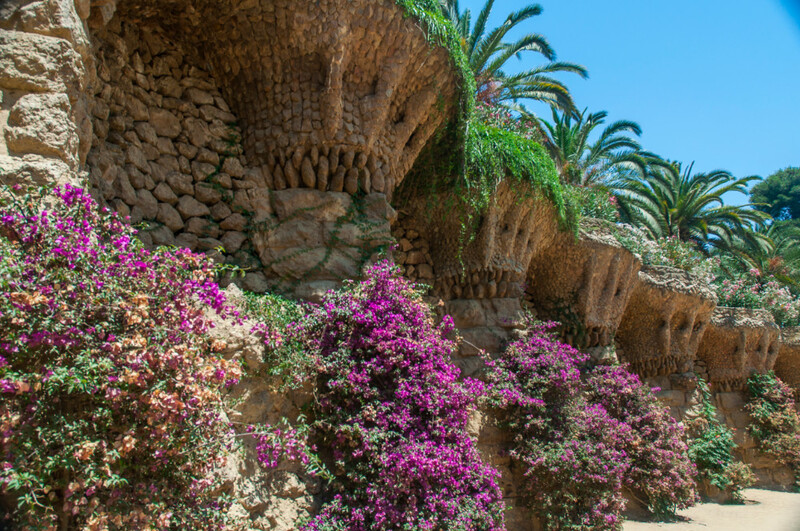 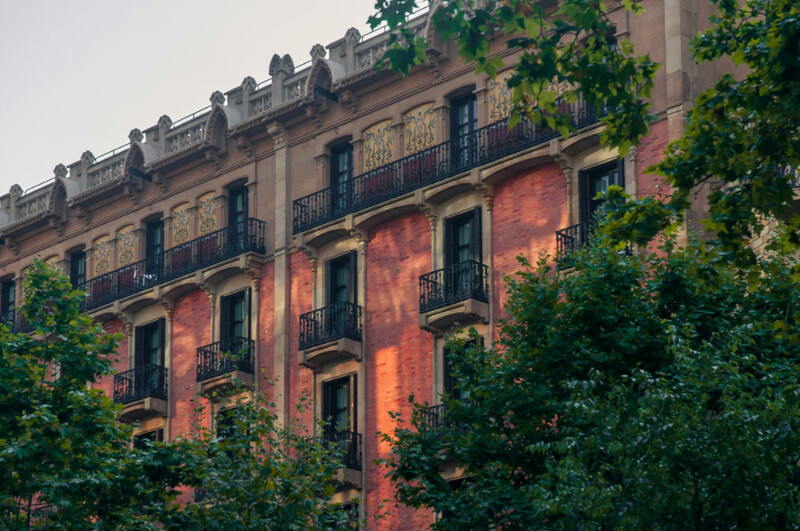 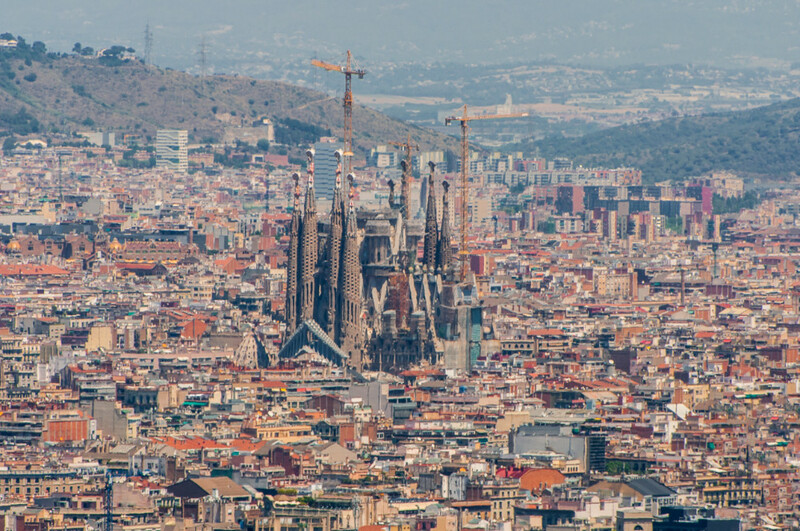 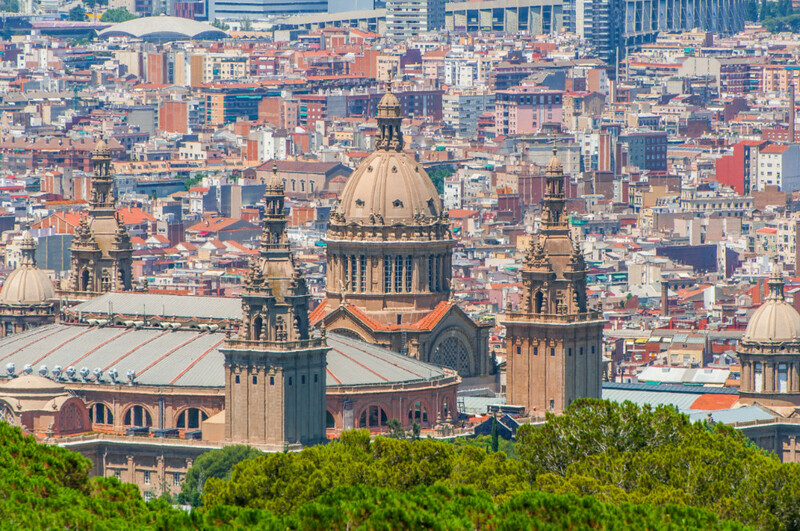 Barcelona is hands down the most popular destination for tourists visiting Spain. 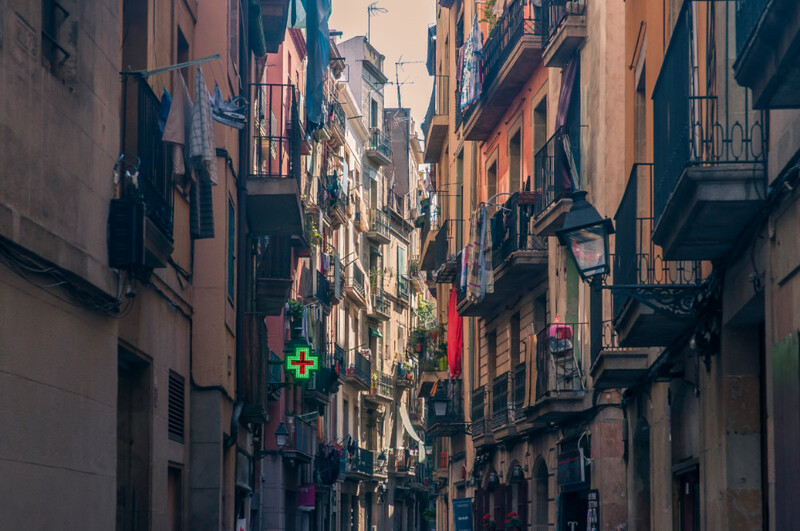 There you will find hundreds of restaurants, bars, and stores of all kinds to keep yourself content while you explore the city. 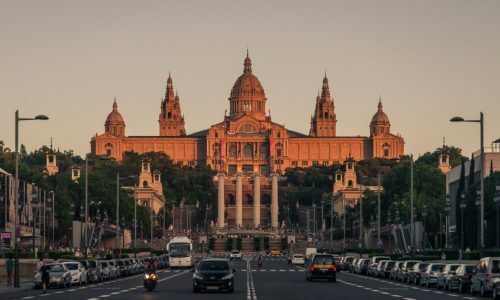 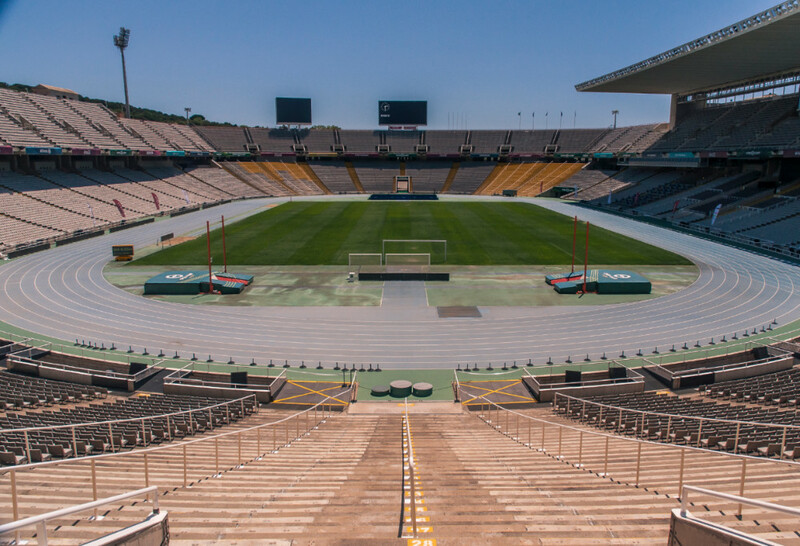 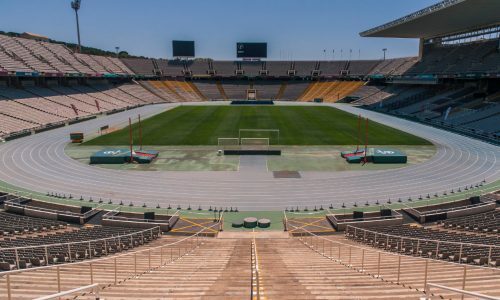 To be honest, Barcelona was my first stop in Europe and I wasn’t all that impressed by the actual beauty of the city. 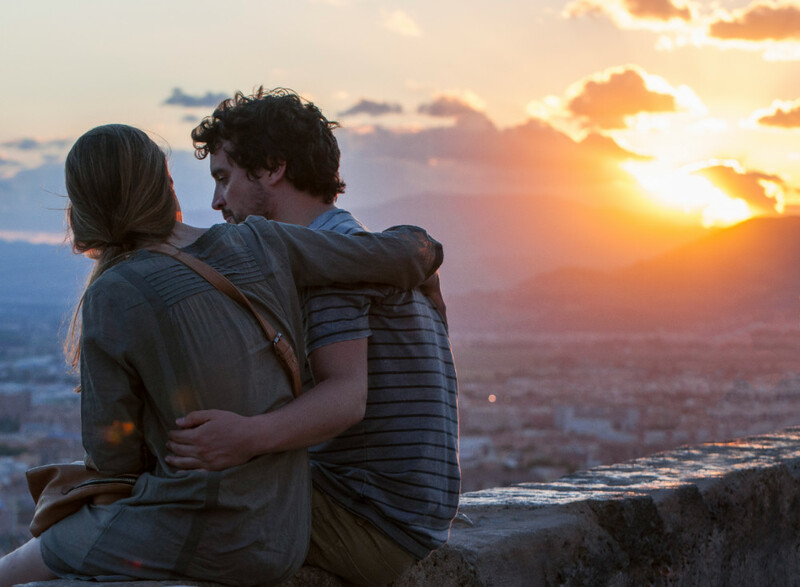 Sure, it is cute, but it didn’t really feel that special, especially compared to everything I was going to see on my trip. 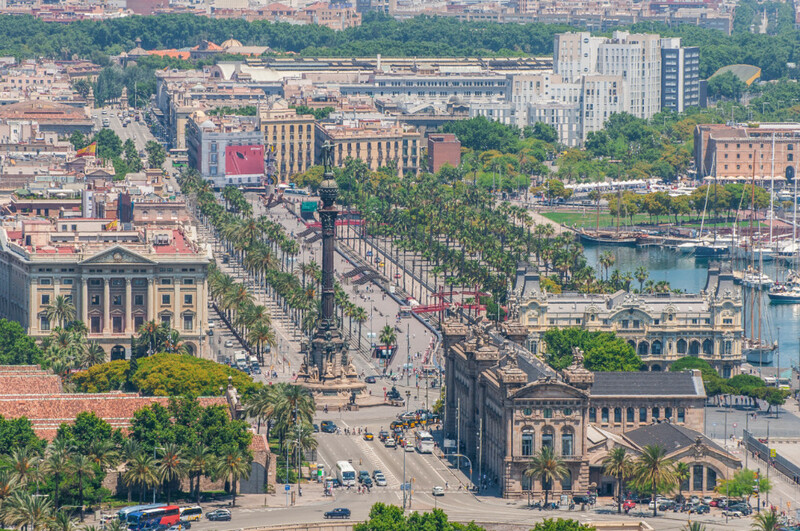 It is insanely expensive compared to pretty much any other city in Spain, and most places including the beach are beautiful but way too crowded. 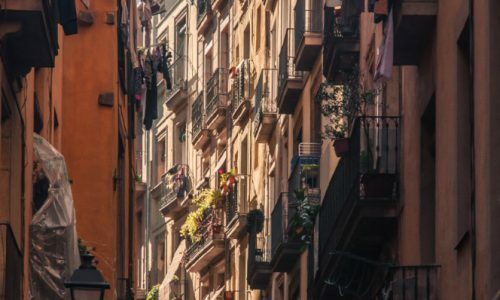 It is still good fun to explore, especially if you’ve got a good budget, but I would recommend other cities before Barcelona. 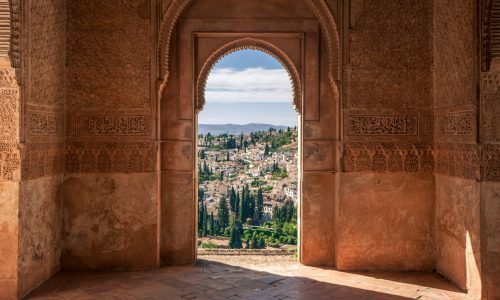 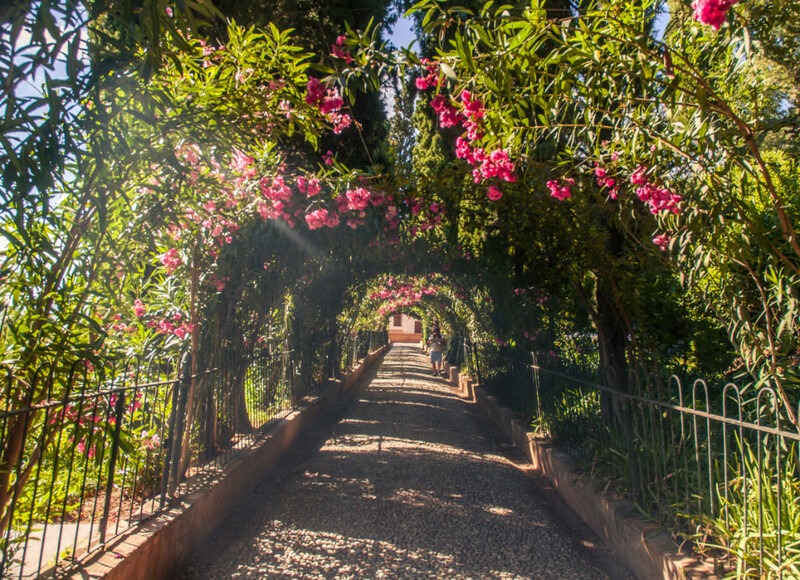 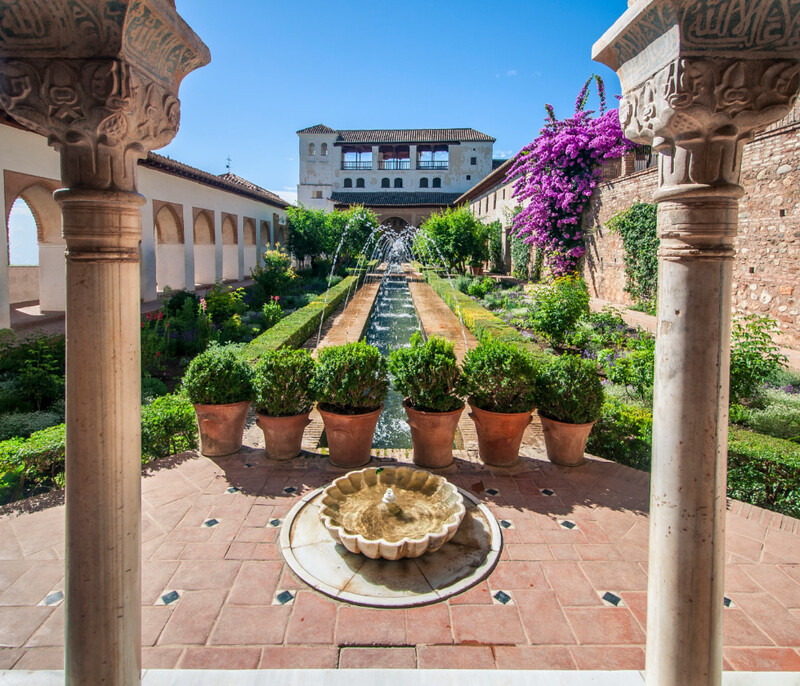 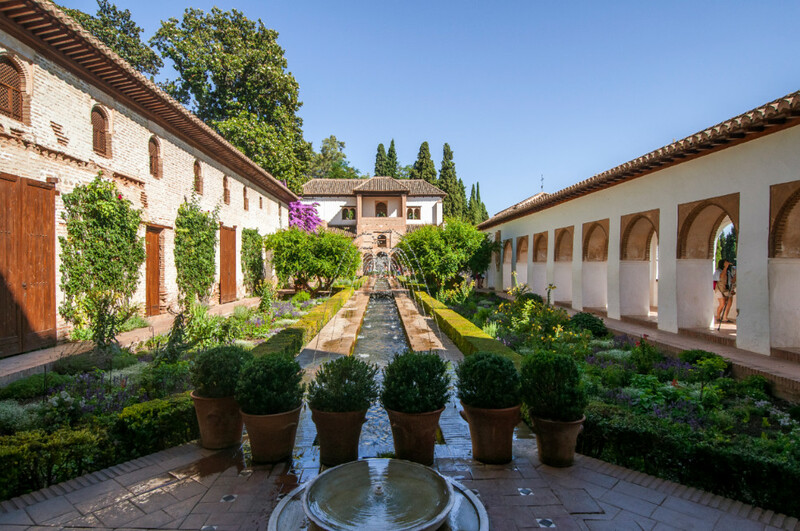 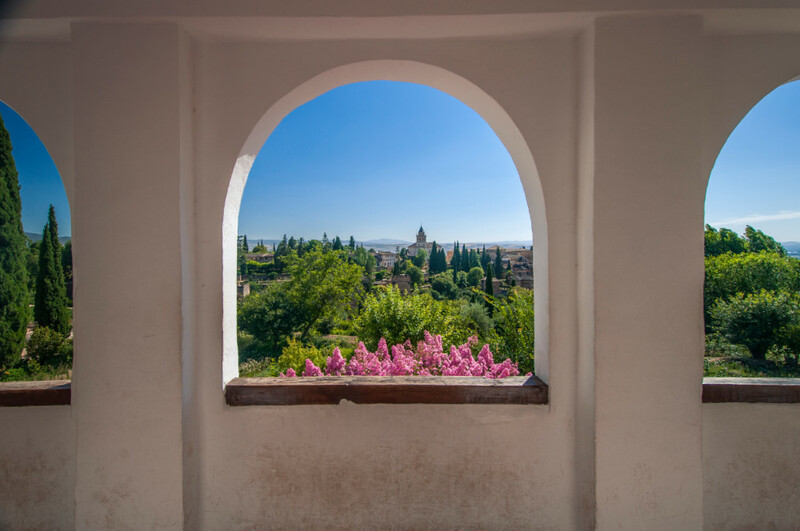 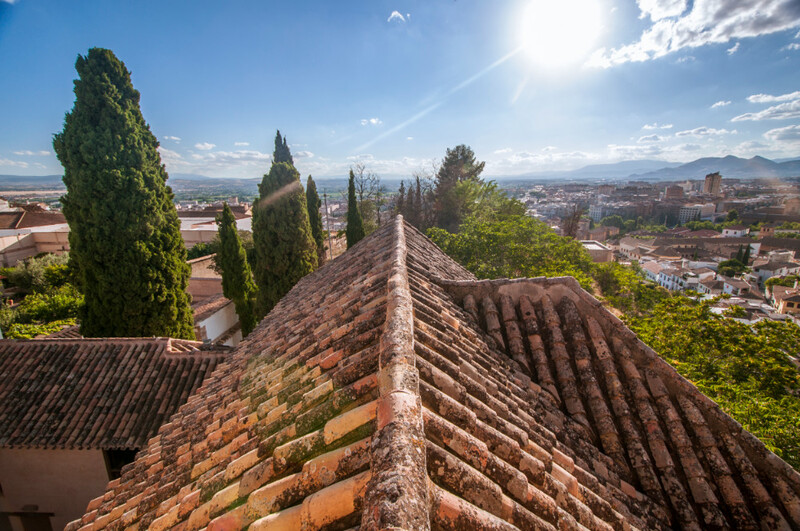 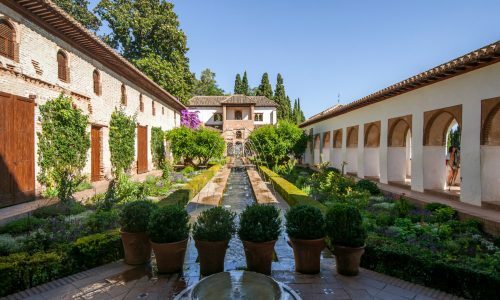 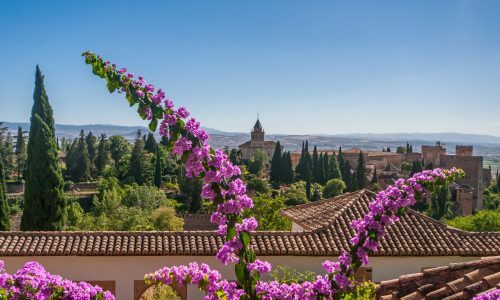 Granada is many people’s favorite city in Spain, and it’s easy to see why when you wander around. 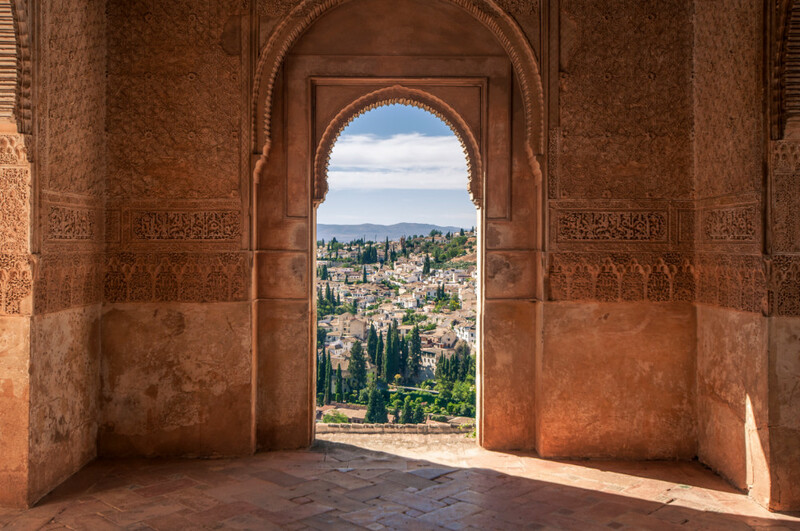 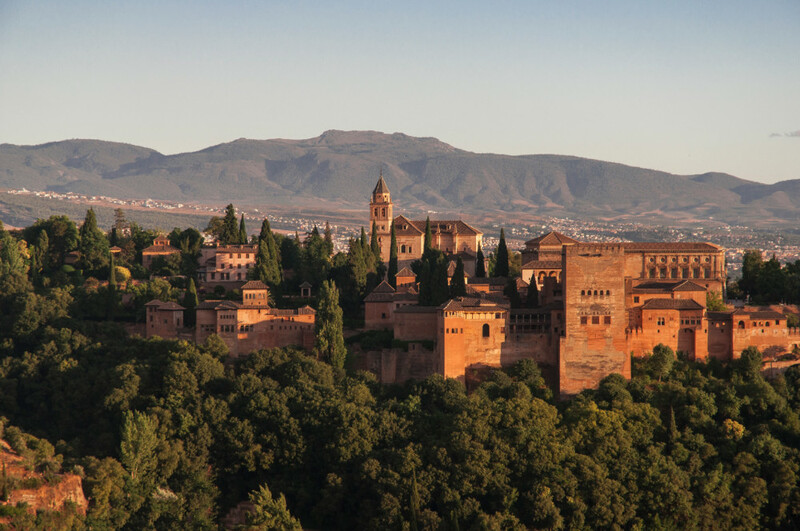 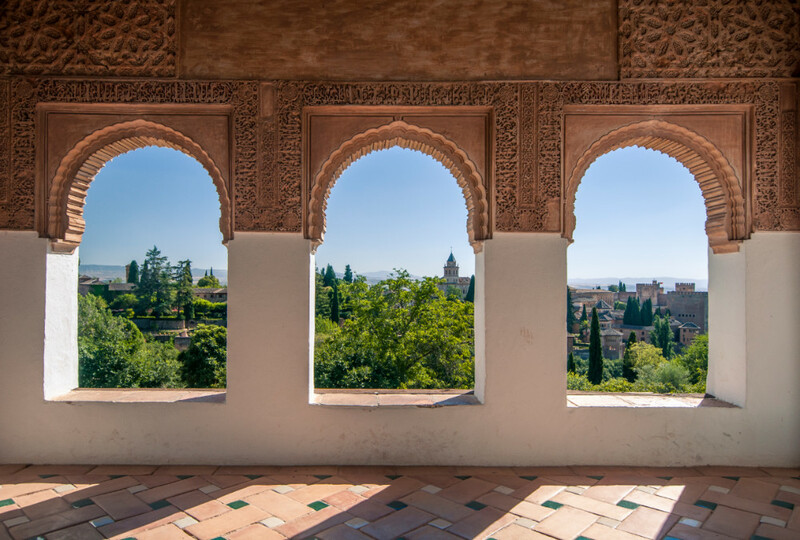 On top of a hill in the middle of the city sits the famous Alhambra, a large palace city that is worth seeing both from the inside and the outside. It is recommended to book tickets in advance, especially if you are visiting during peak season (June-August). 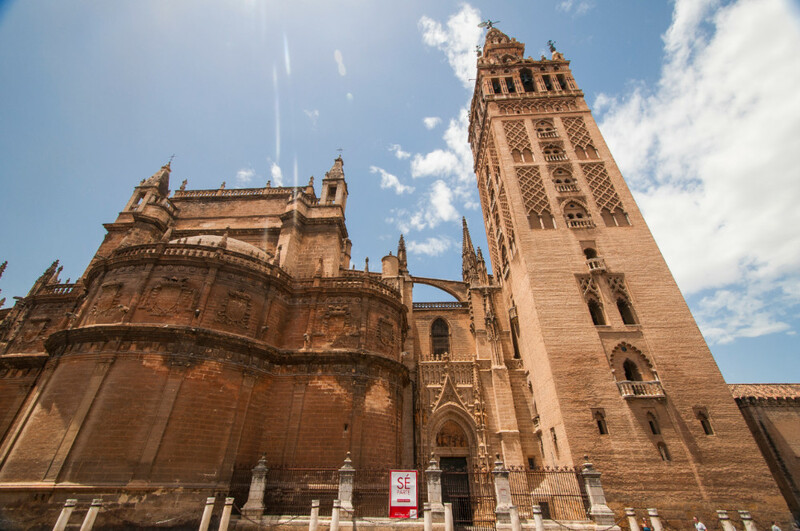 Otherwise, you can simply explore the many districts of the city where you’ll find a fascinating diversity of religions and cultures. 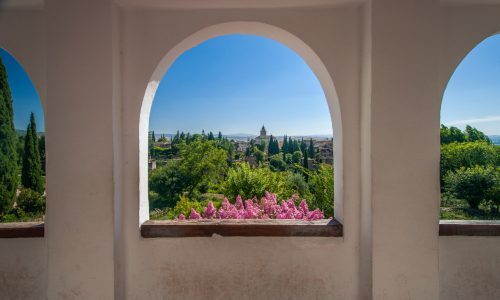 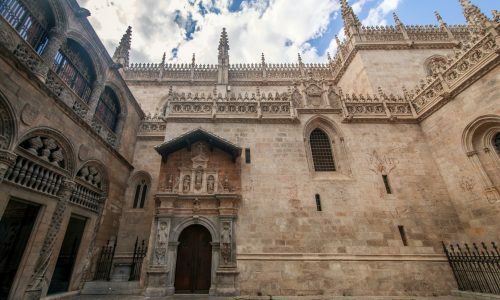 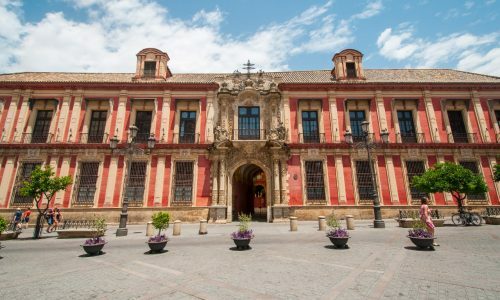 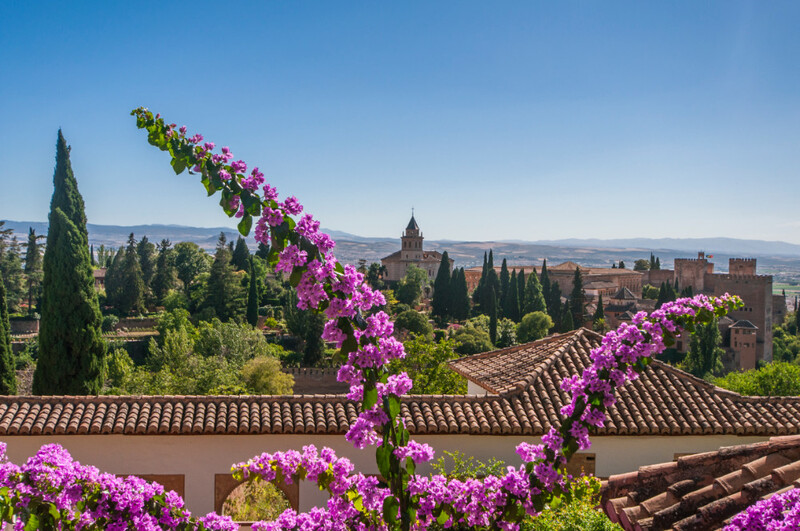 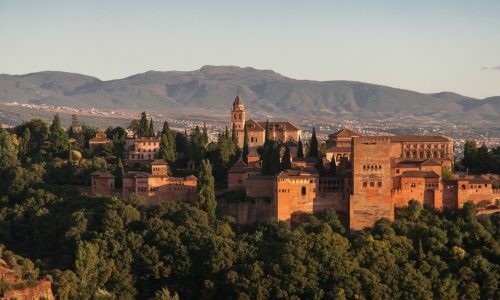 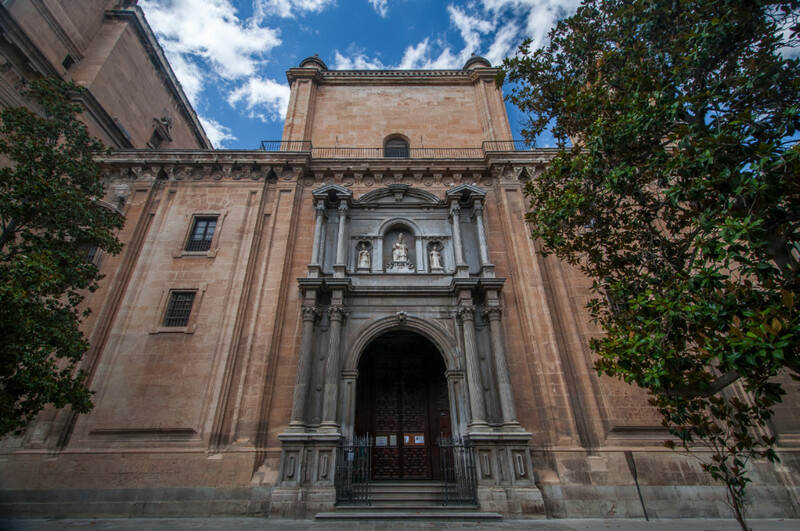 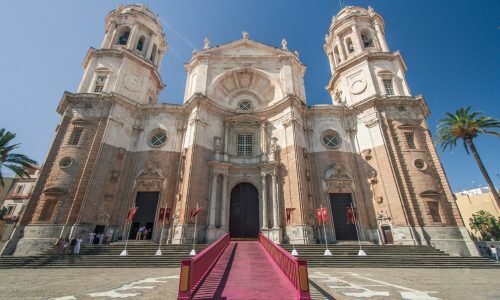 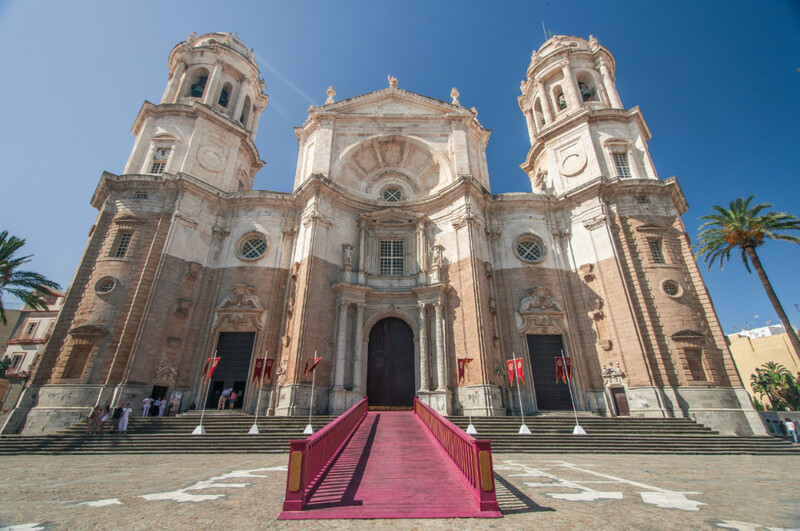 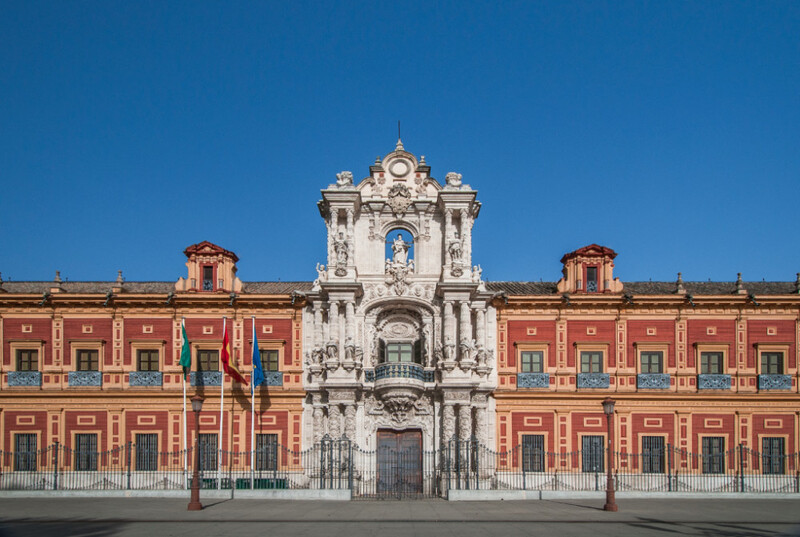 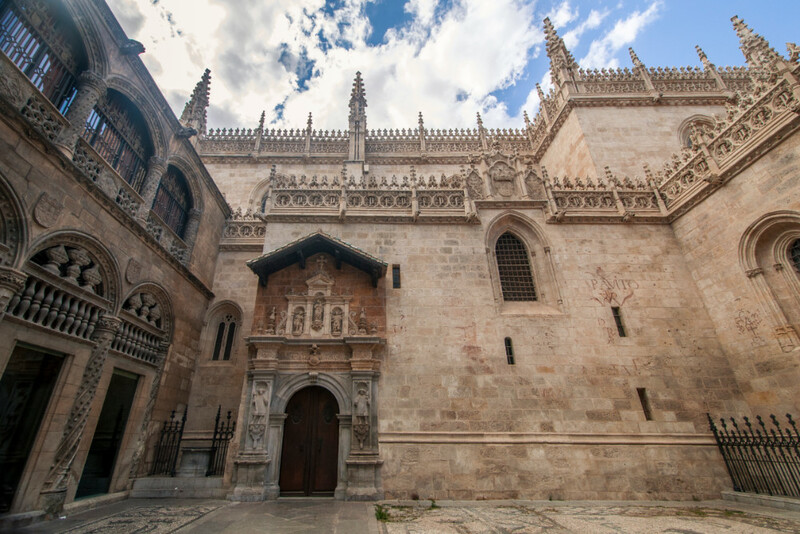 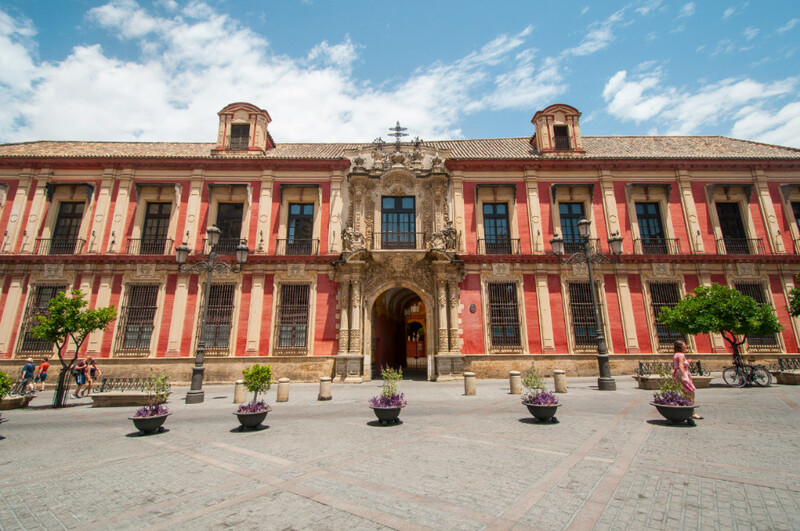 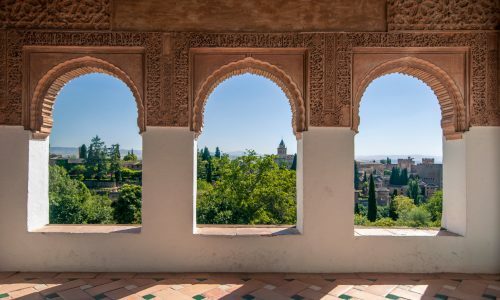 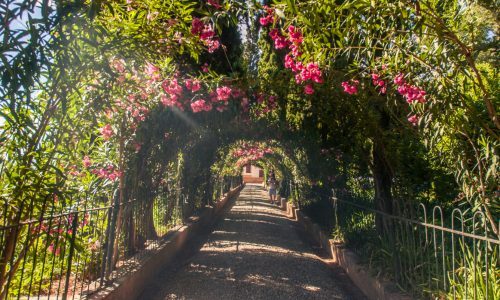 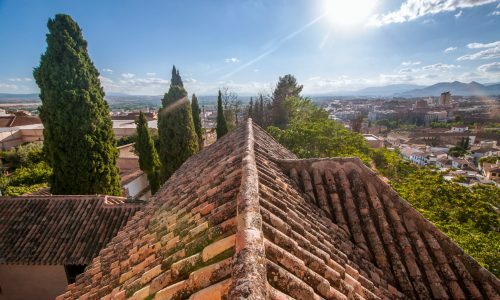 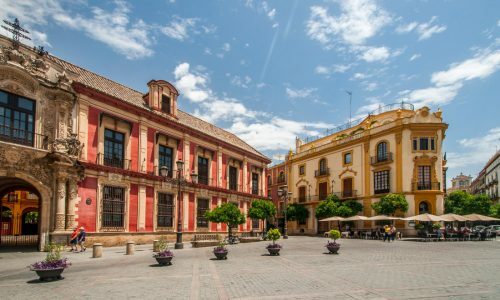 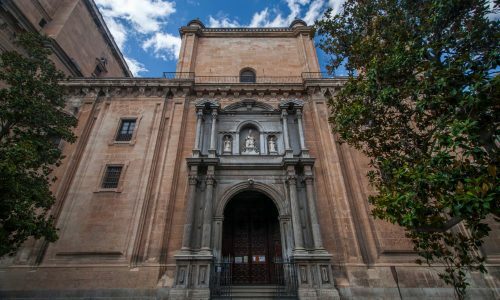 It is also a good spot to eat tasty, cheap tapas and to go out as the University of Granada alone welcomes a whopping 80,000 students each year. 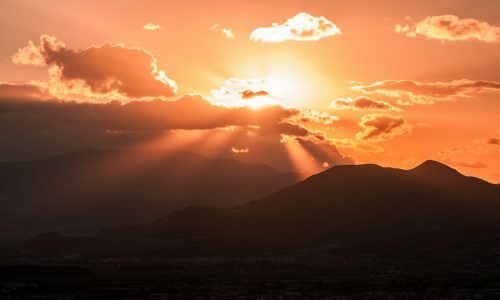 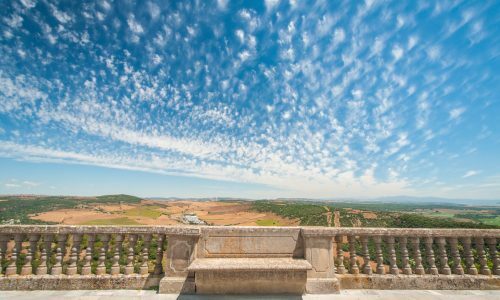 Finally, don’t miss out on the Mirador de San Miguel, a church offering an epic view overlooking the city, perfect to enjoy the sunset. 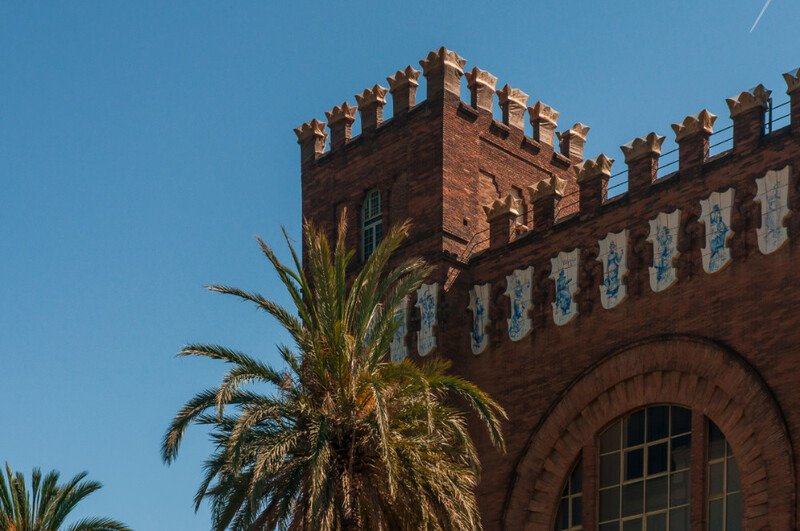 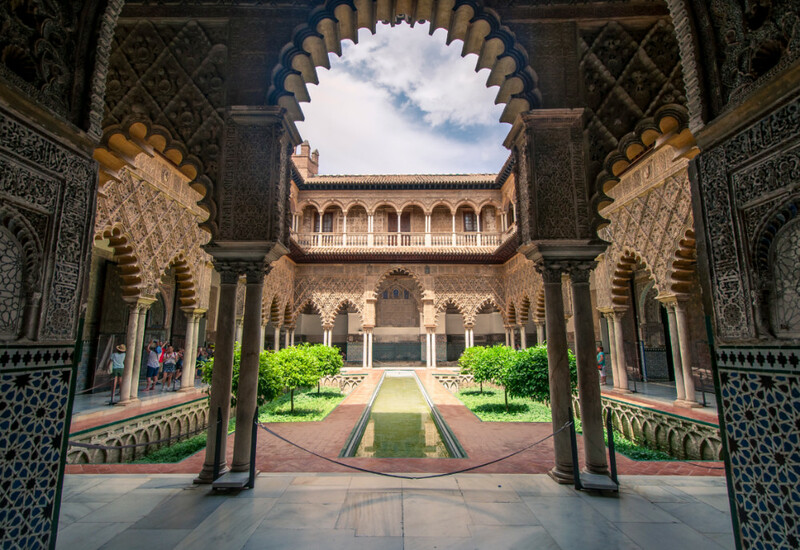 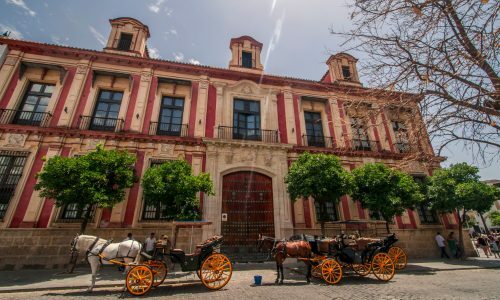 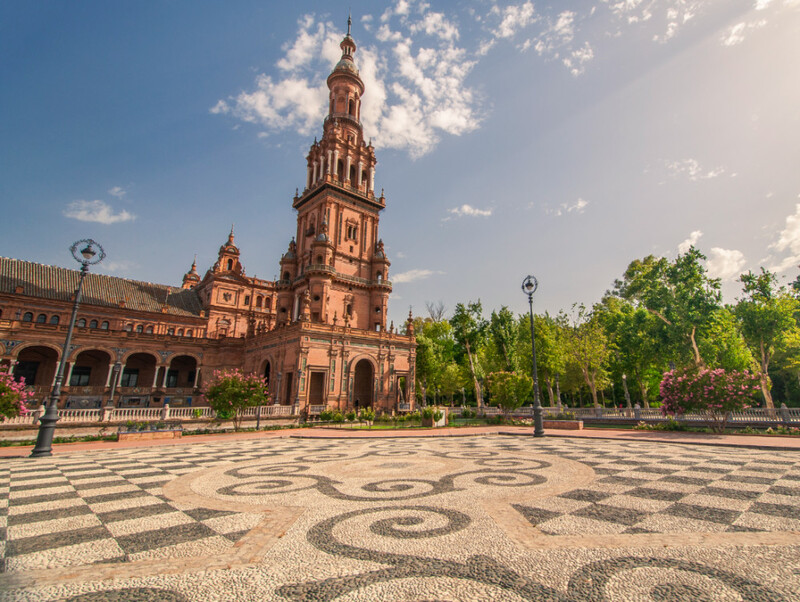 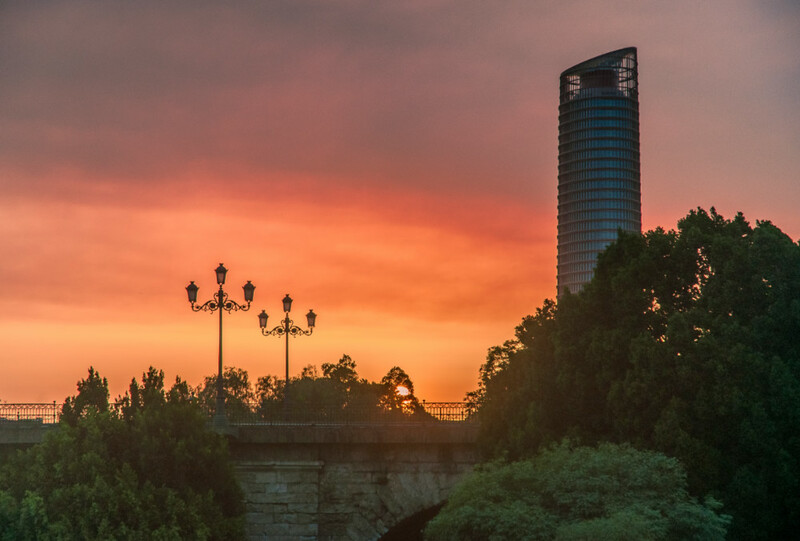 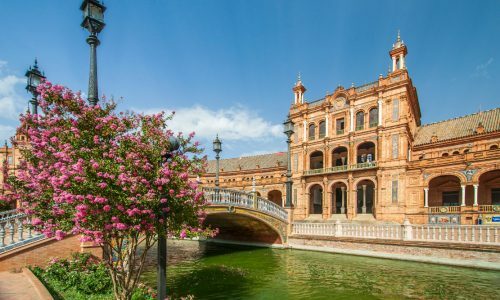 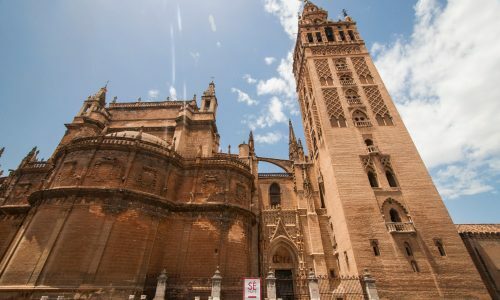 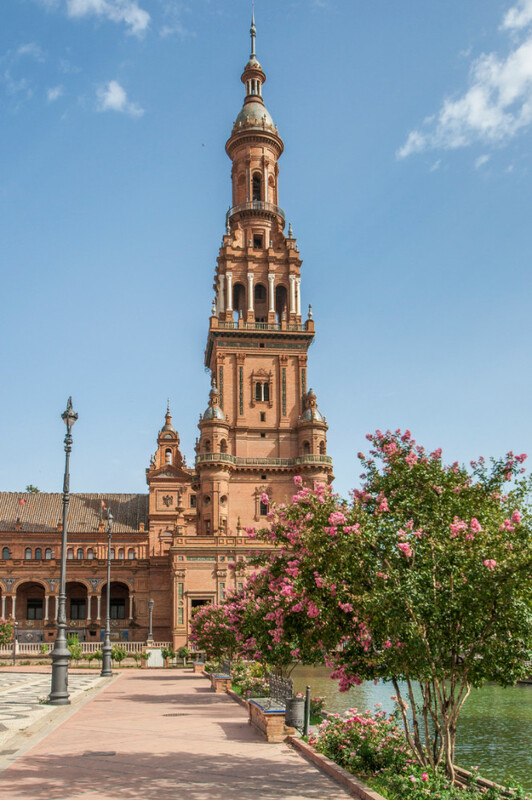 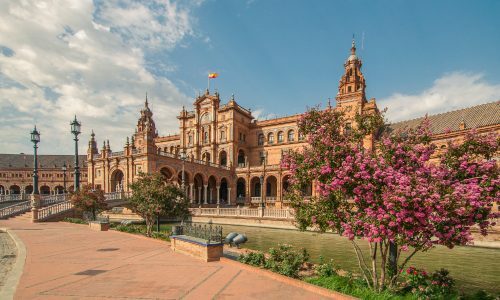 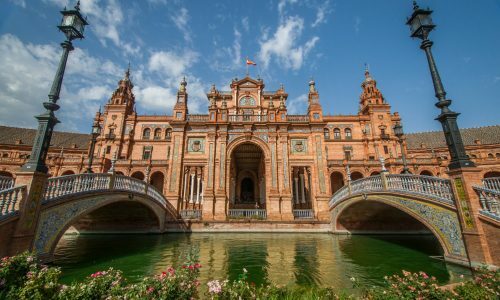 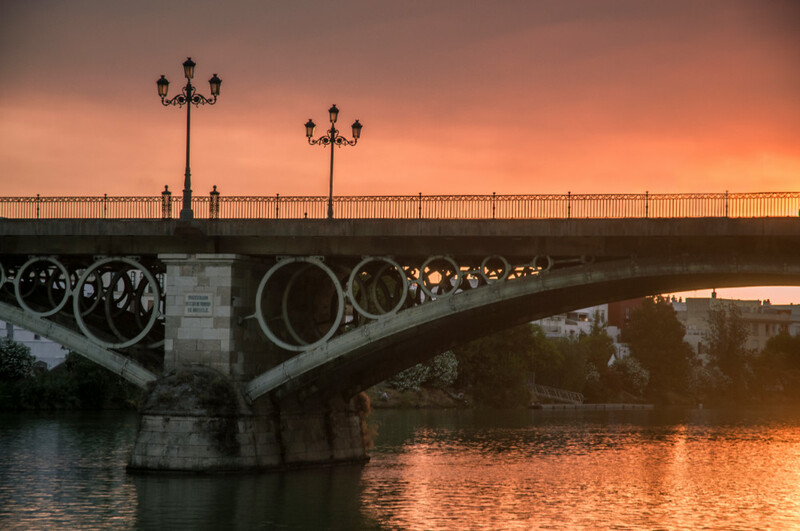 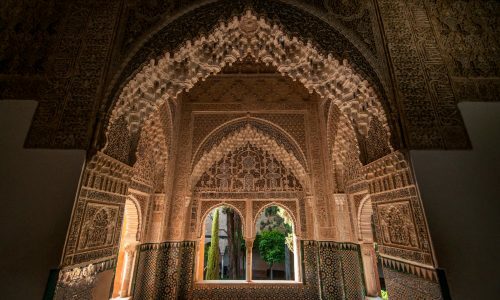 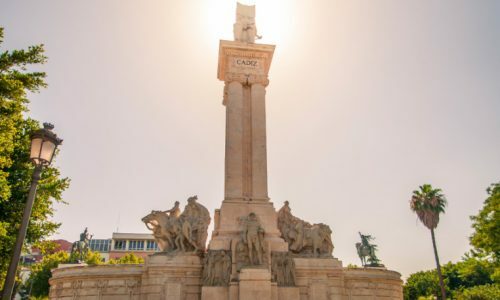 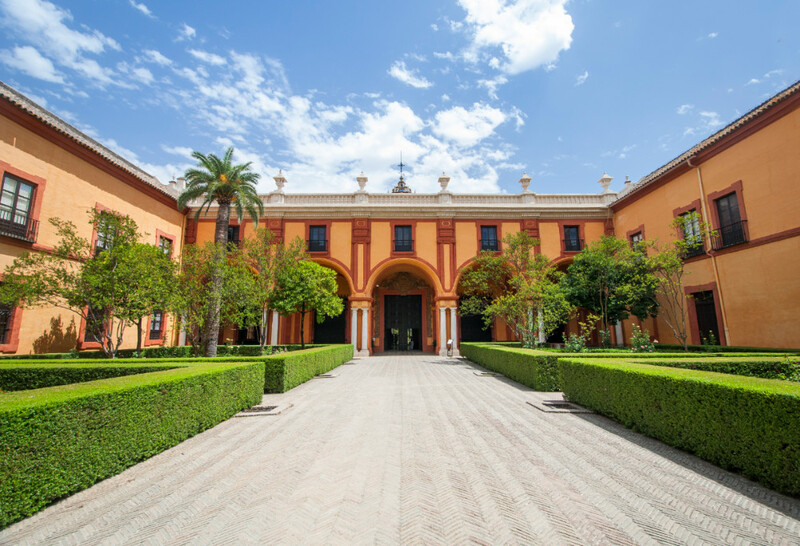 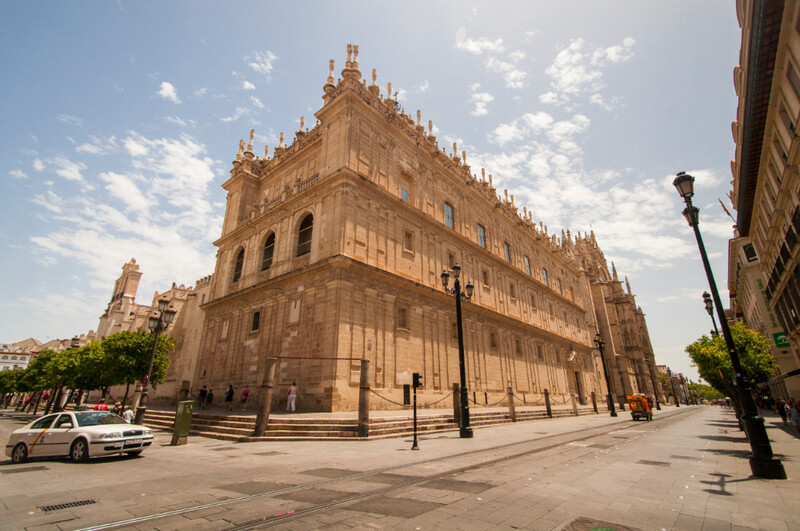 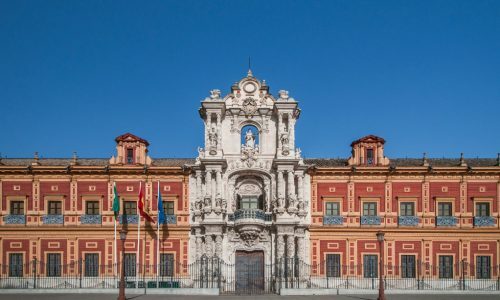 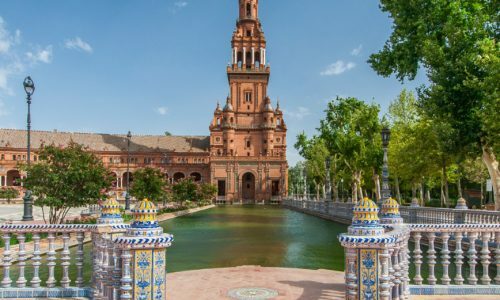 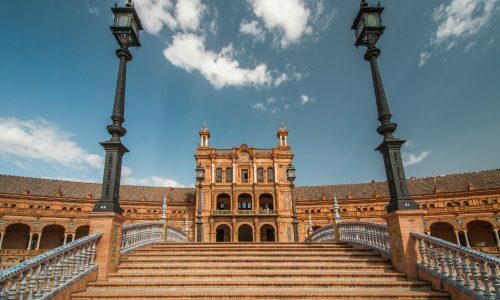 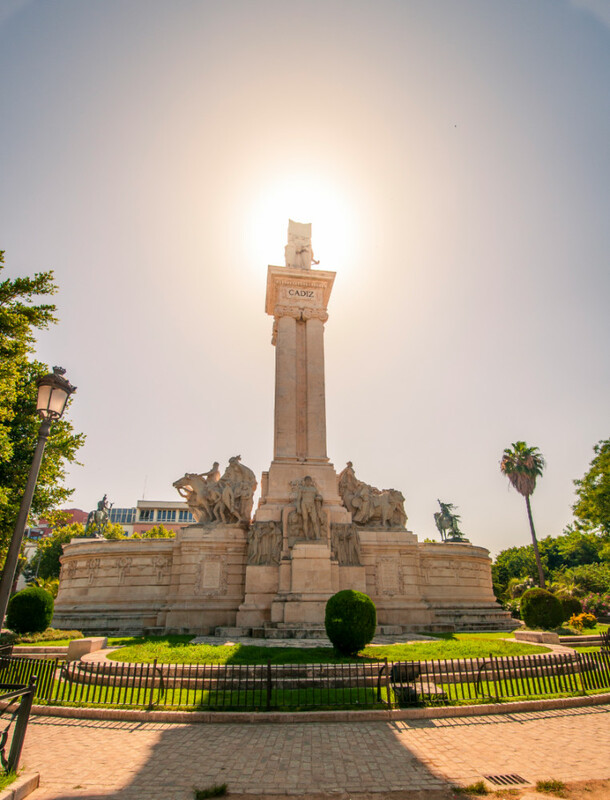 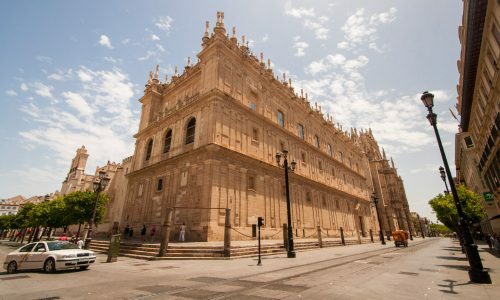 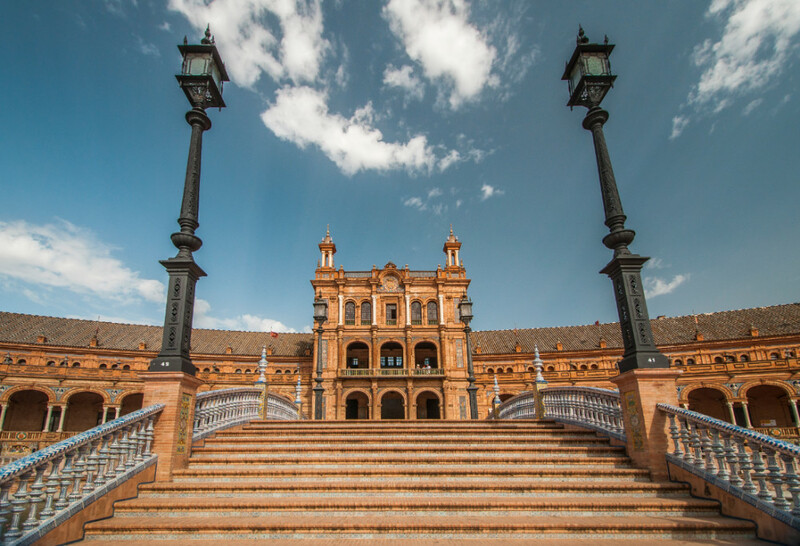 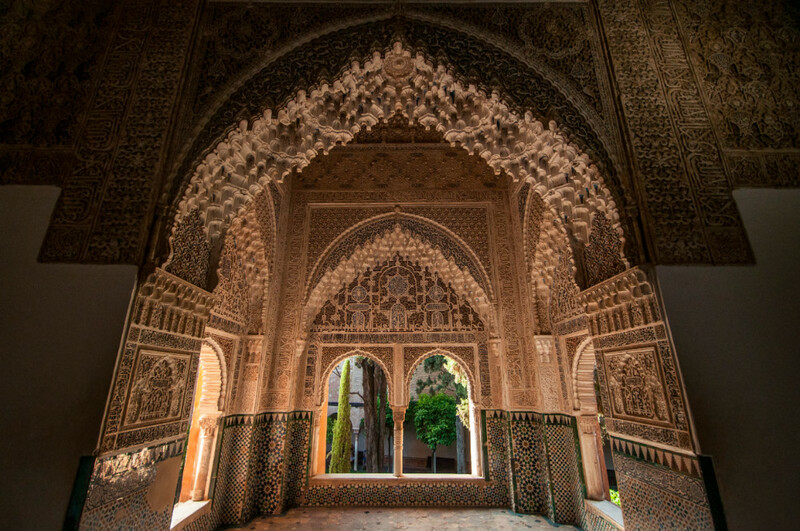 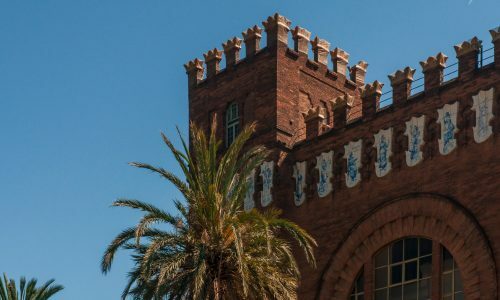 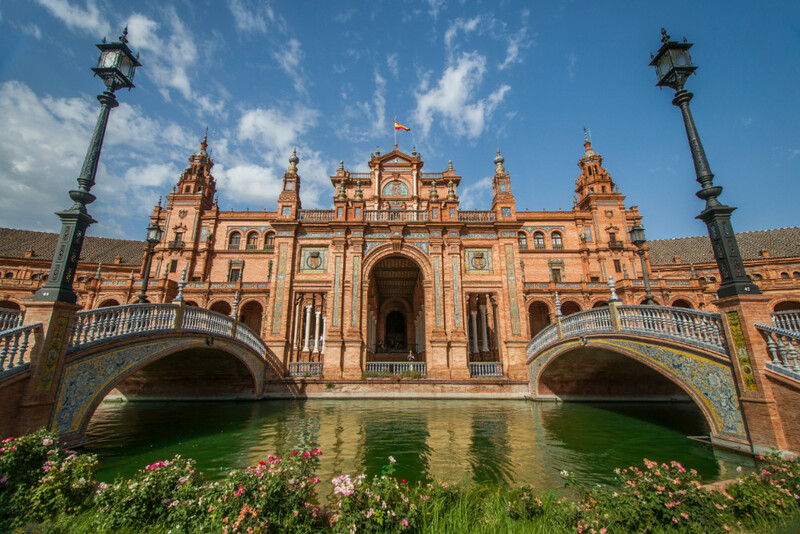 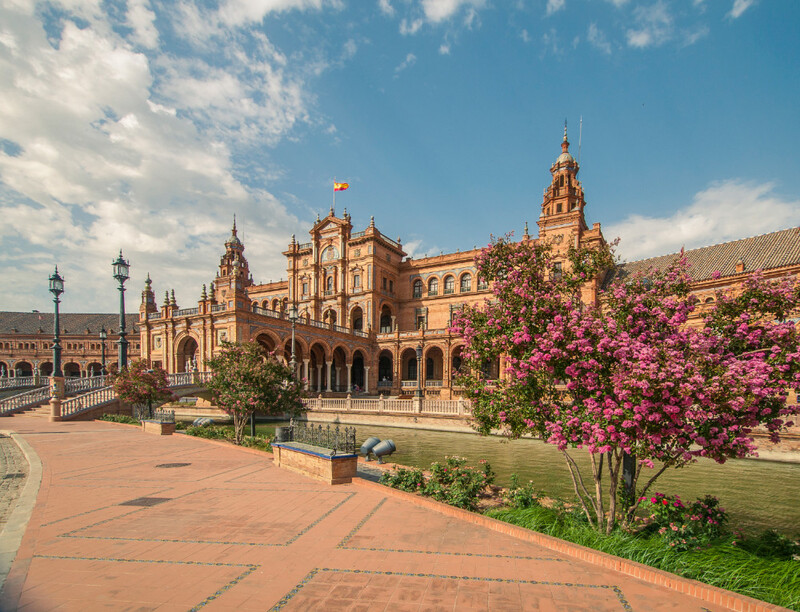 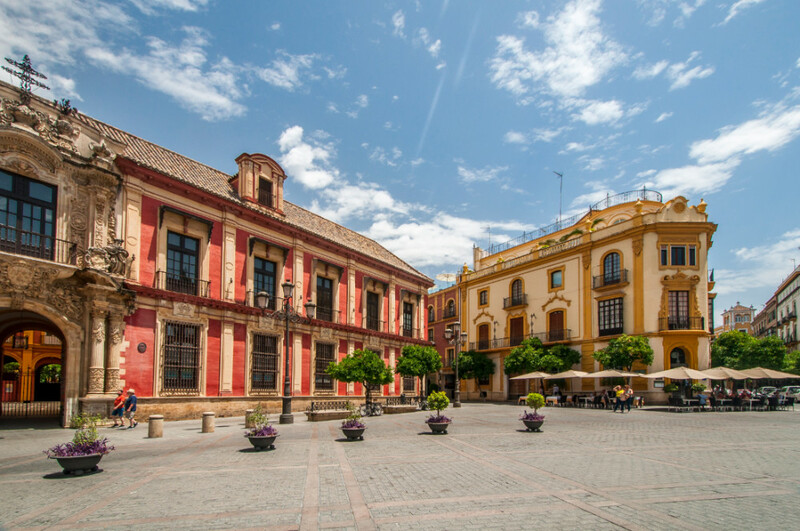 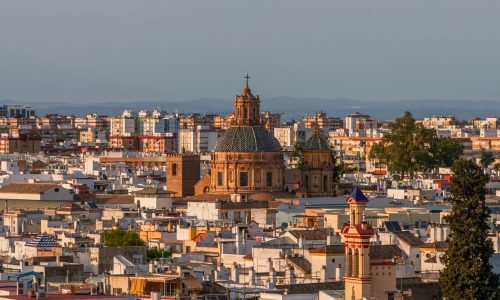 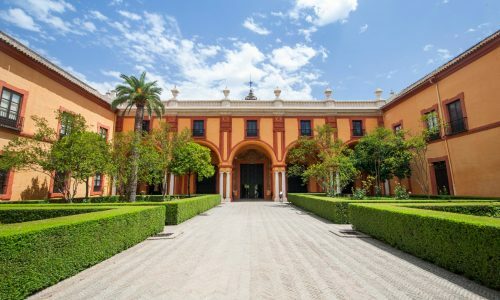 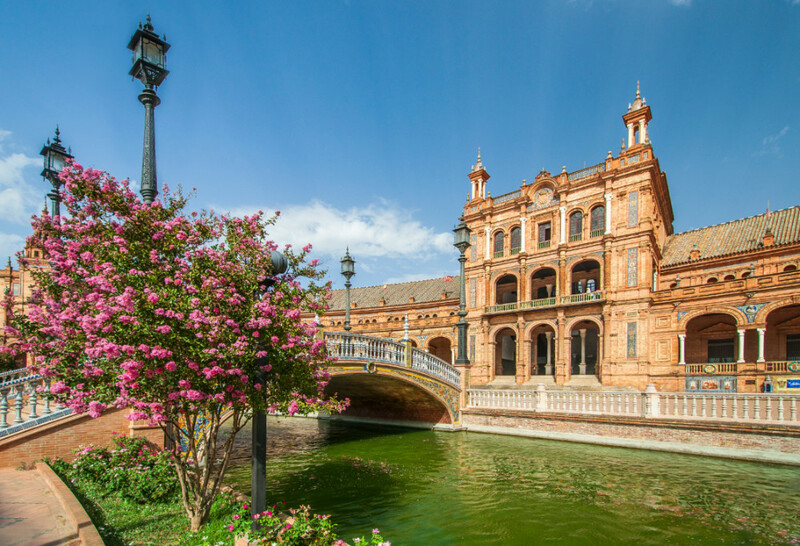 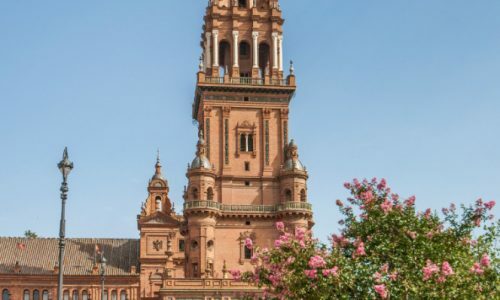 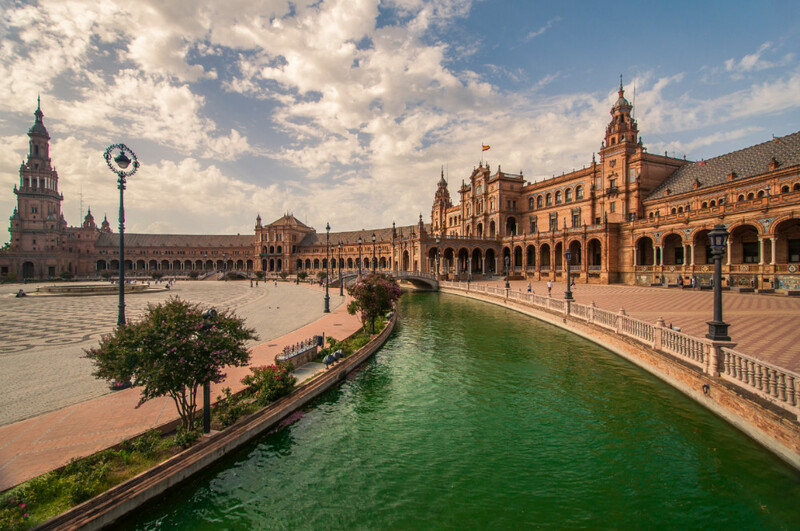 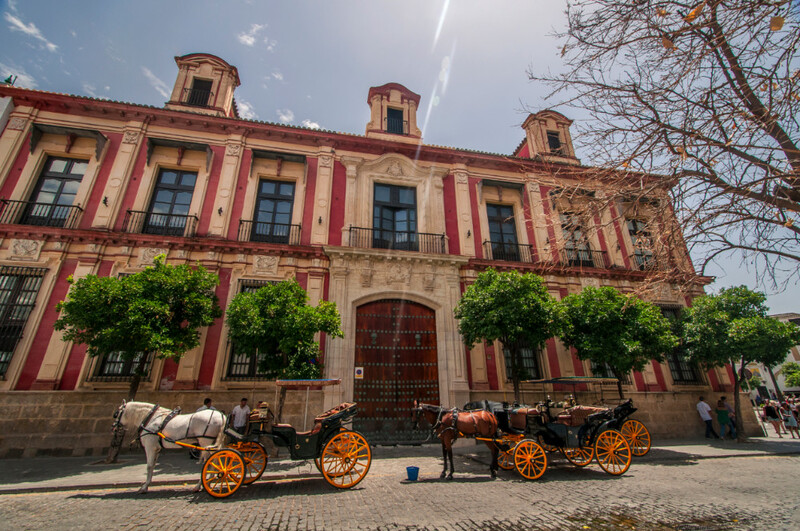 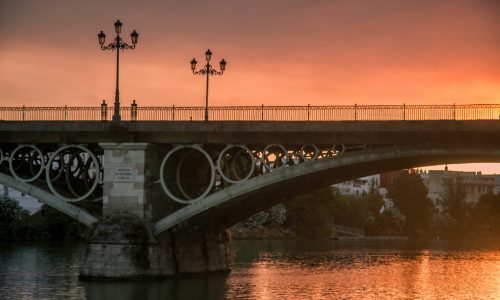 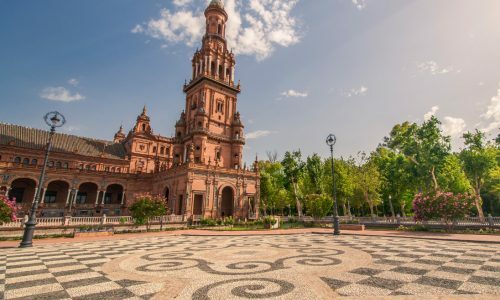 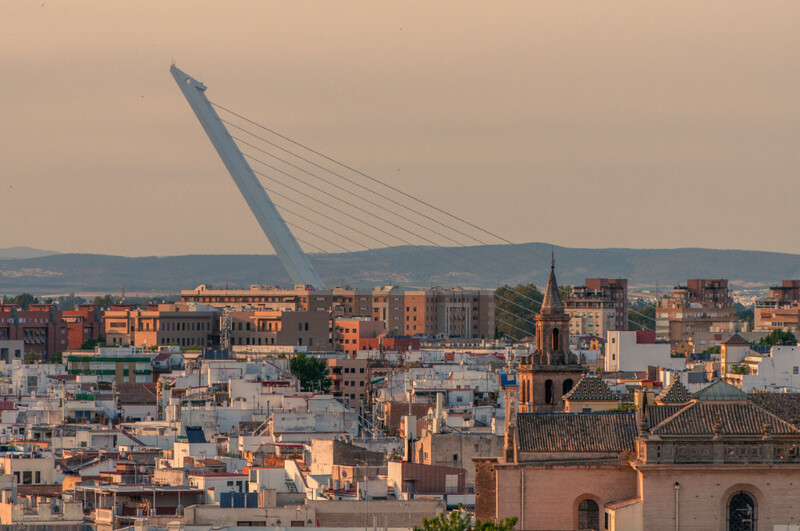 Sevilla used to be the capital of Spain back in the days and therefore is a prime destination for whoever is interested in the Spanish history and culture. 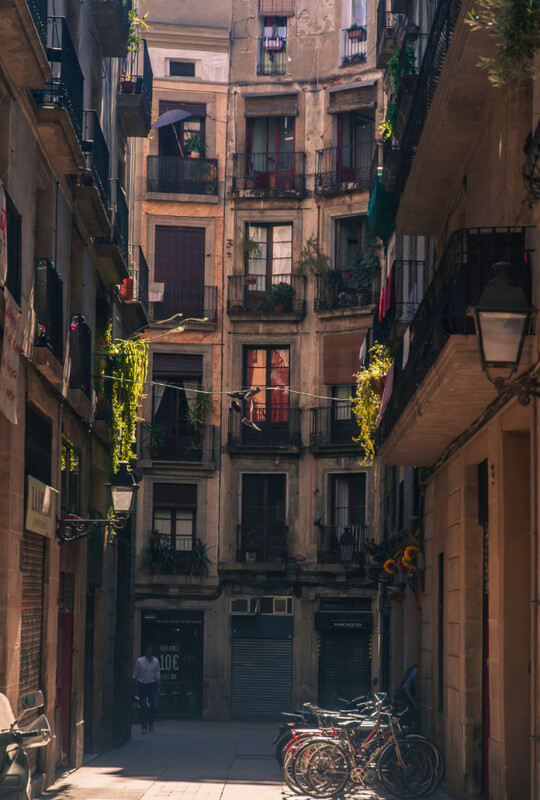 I thought the city was really charming and fun to explore on foot, even though it was nearly forty degrees when we were there. 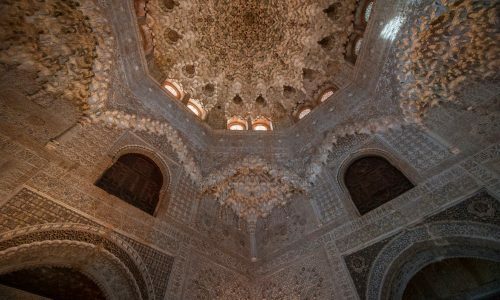 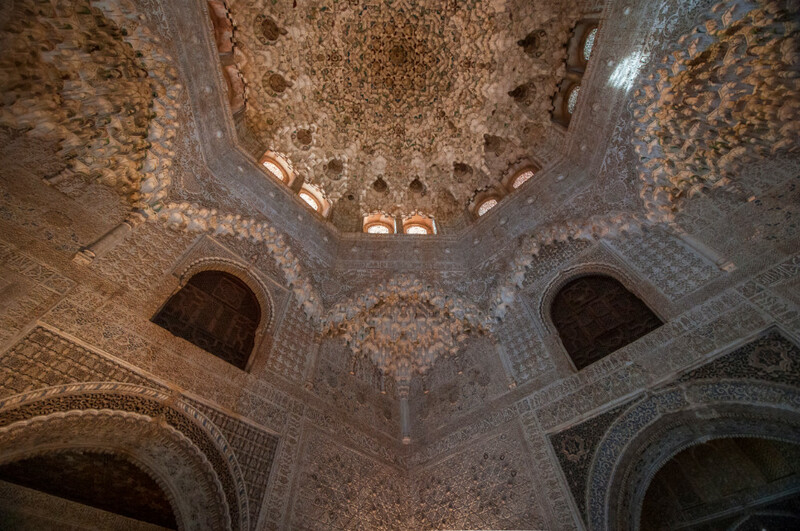 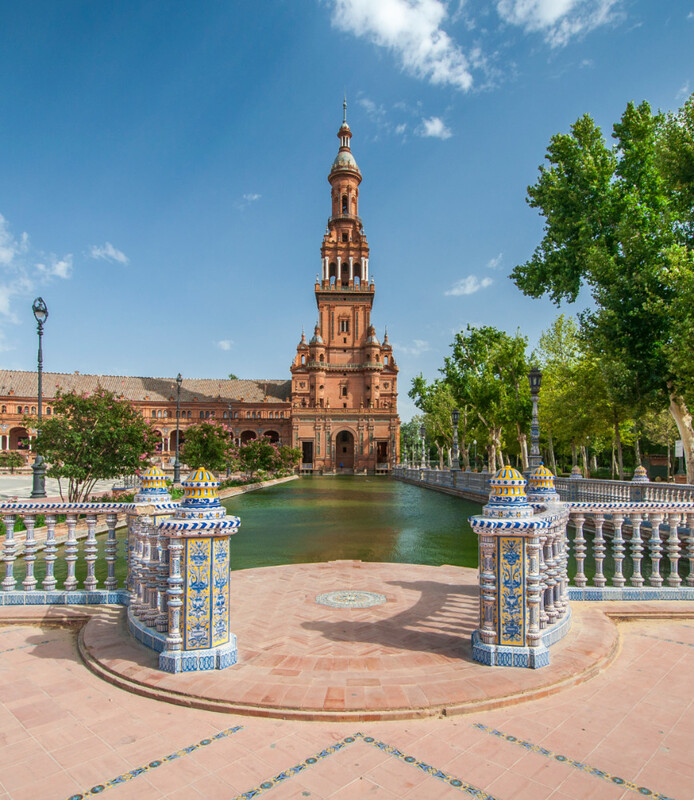 Make sure you check out the Plaza de Espana, the most beautiful one I’ve seen in Spain. 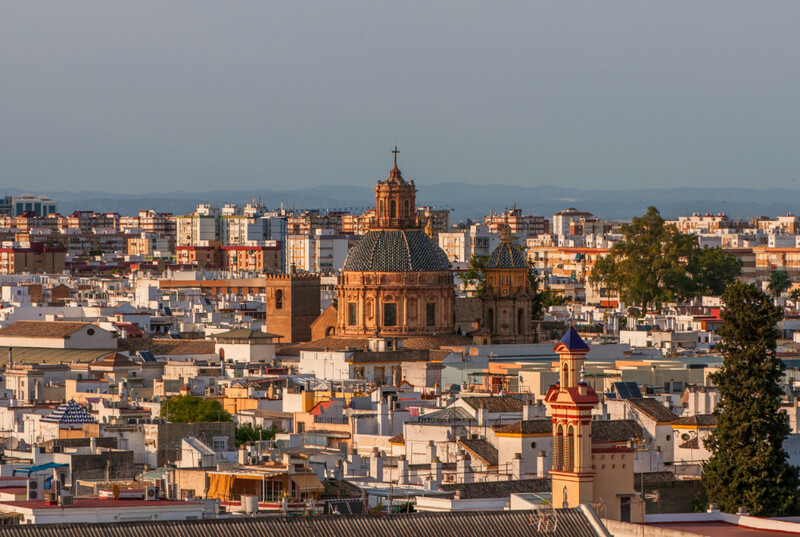 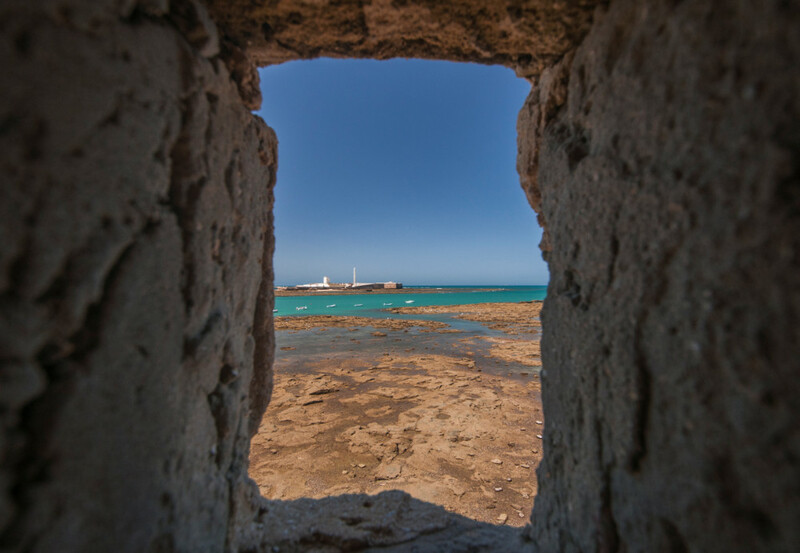 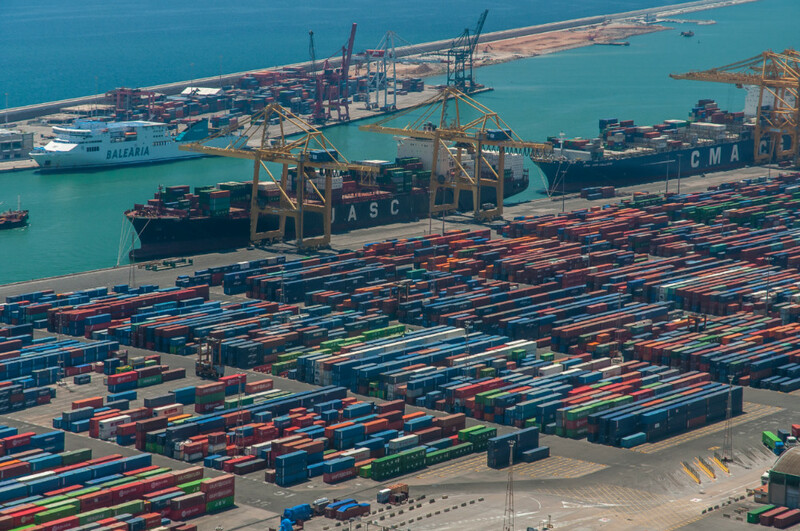 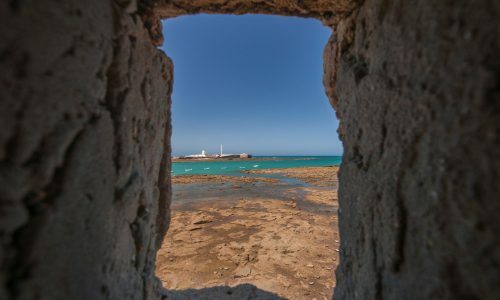 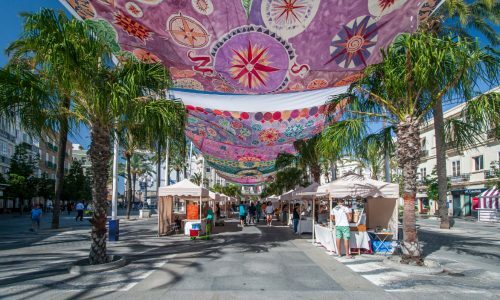 Cadiz is a cute, ancient city located in southwestern Spain that used be an important base for exploration and trade. 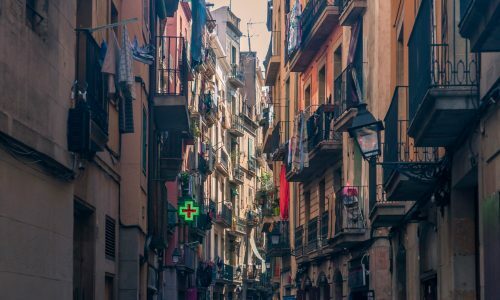 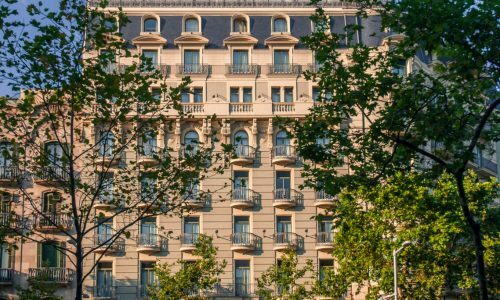 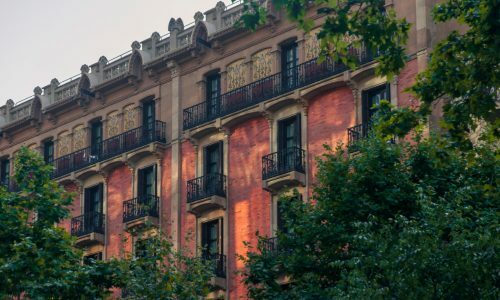 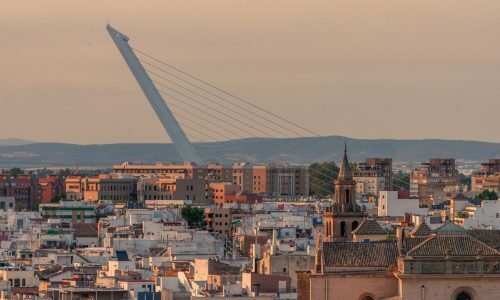 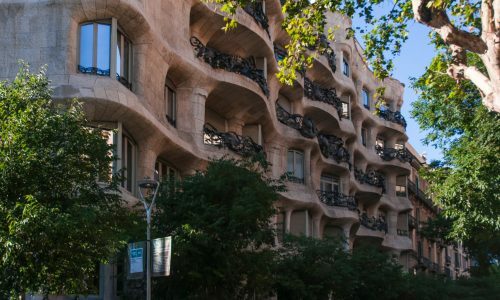 While it has become a little more touristy recently, it is still a nice counterpart to the crowded big cities of Spain like Barcelona and Sevilla. 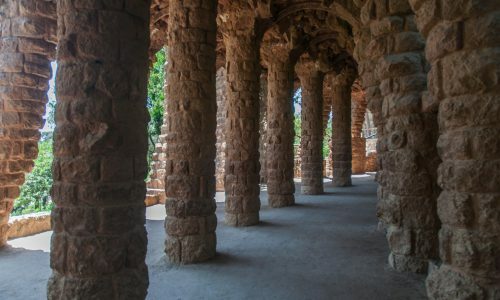 My friend only spent half a day there but we both felt like we had had enough time to explore most of the ancient city. 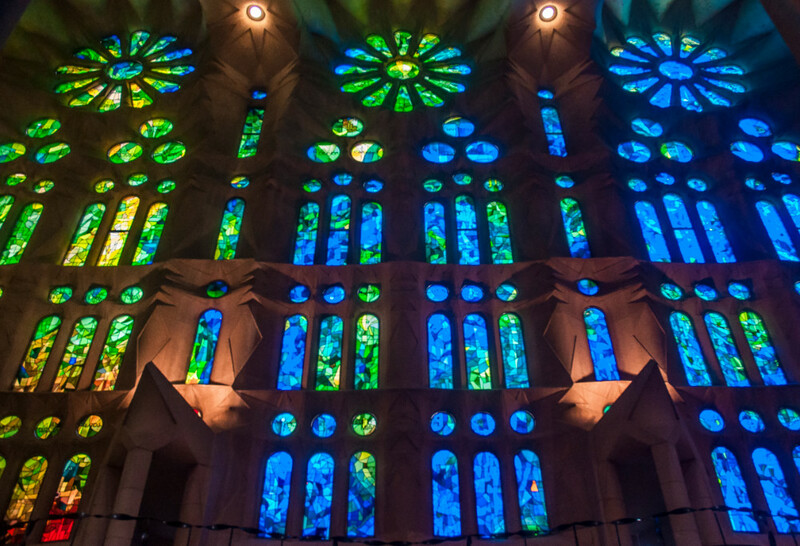 While I wouldn’t qualify it as a must-see, it’s definitely worth a stop if you’re driving by. 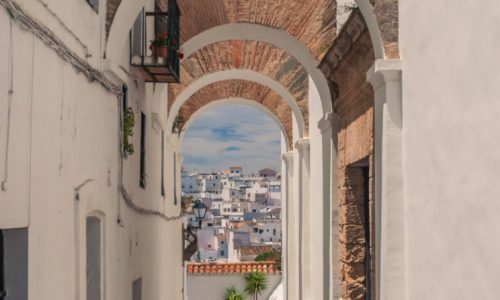 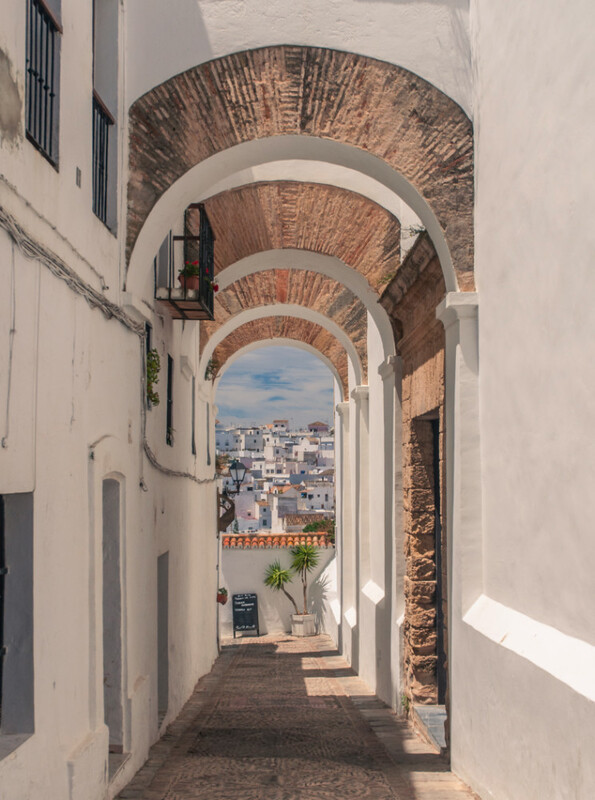 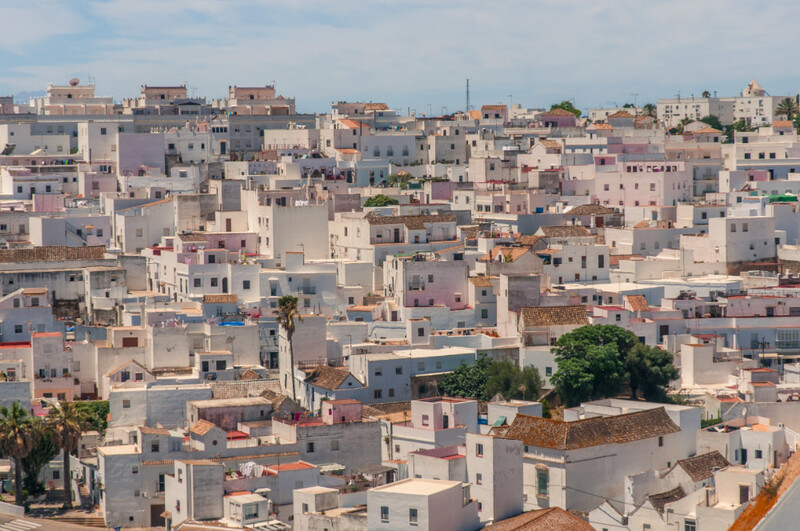 On our way from Cadiz to Tarifa, my friend and I made a brief stop in Vejer de la Frontera, a small city located on top of a mountain in Southern Spain. 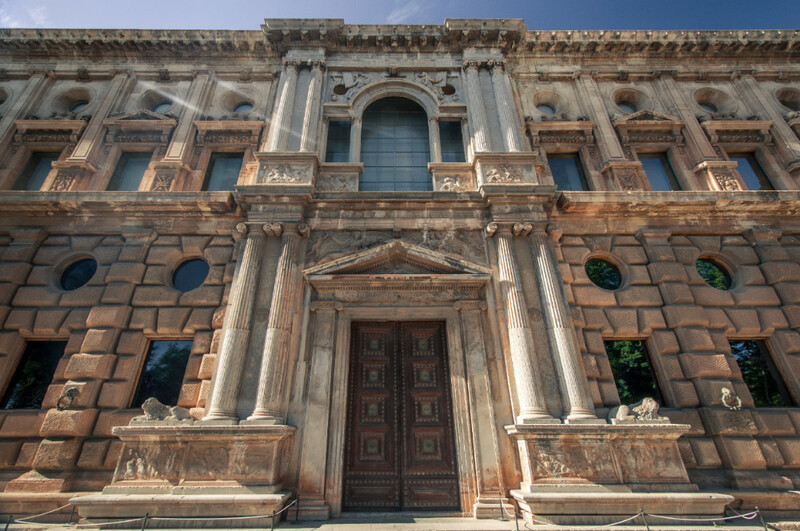 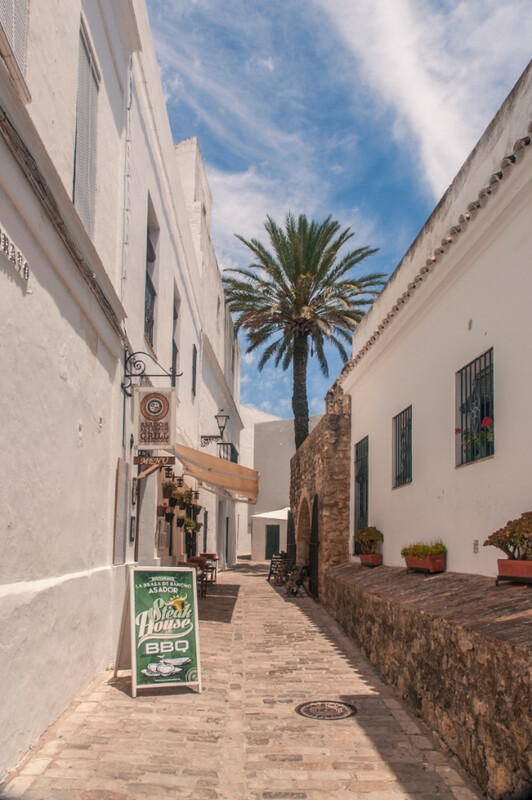 It is the perfect place to stop for an afternoon as a few hours is enough to walk around the entire old town. 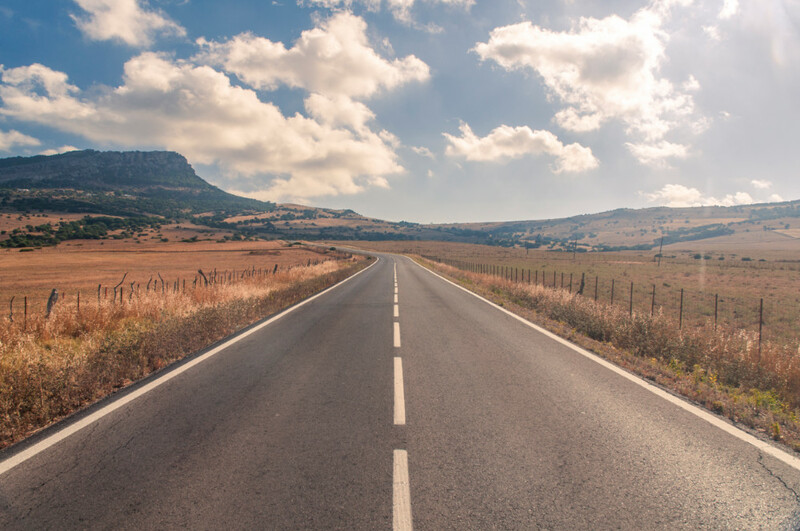 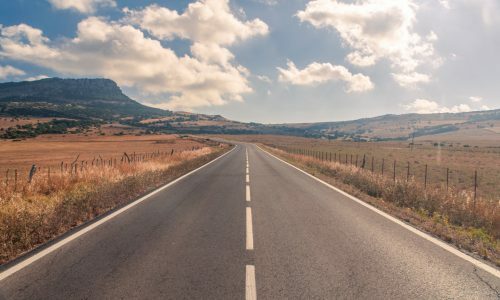 It offers cool views of the surrounding areas and has a few cute restaurants where you can sit down and enjoy a quiet meal before you get back on the road. 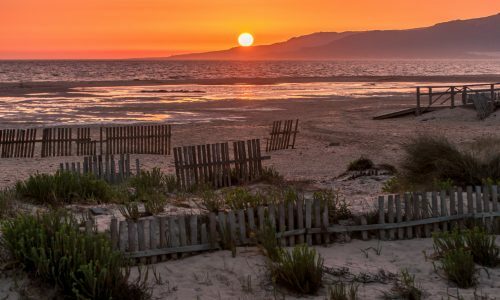 While we only stayed one night in Tarifa while road tripping through Spain, it instantly became one of my favorite places. 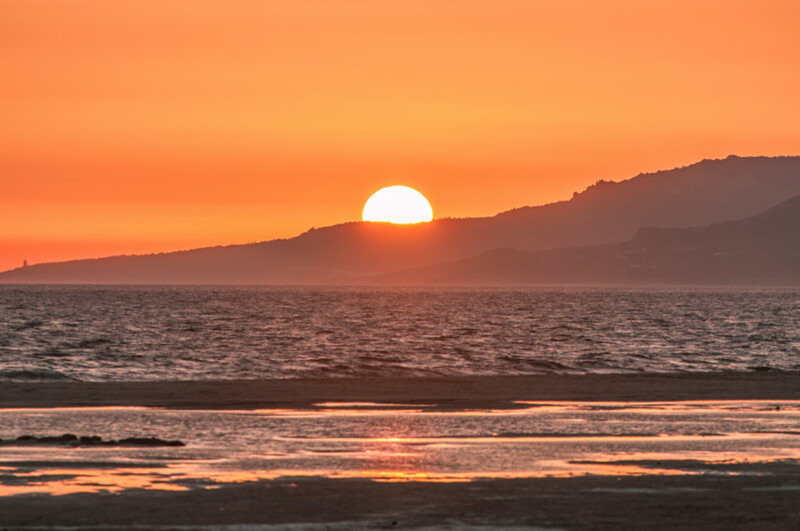 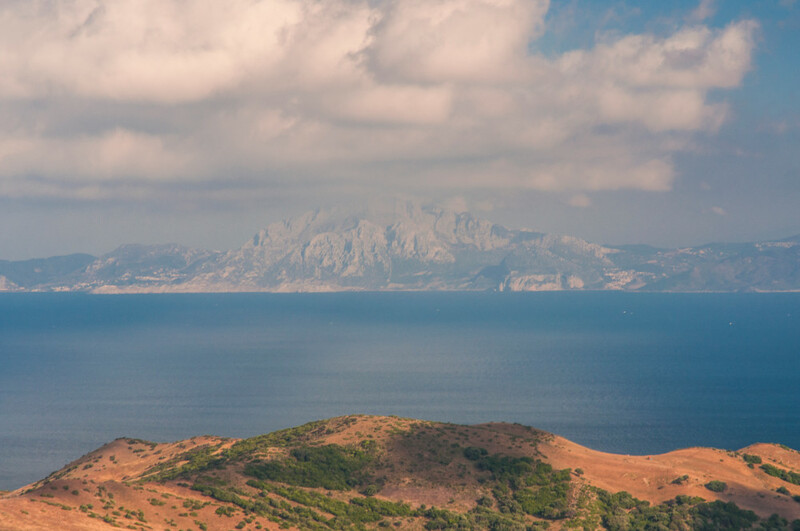 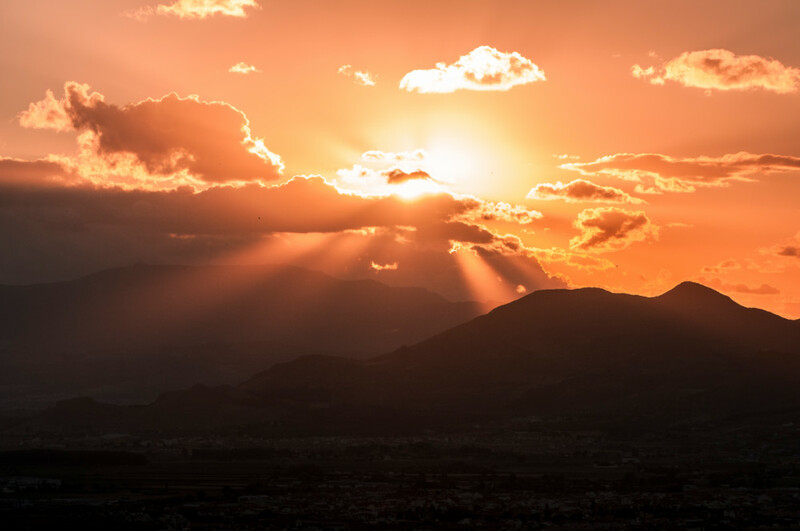 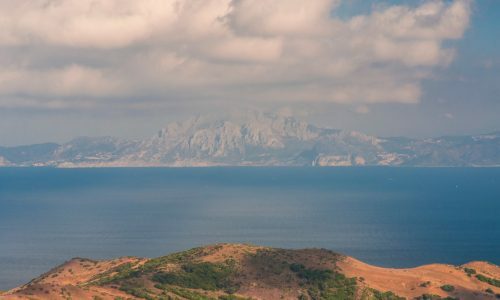 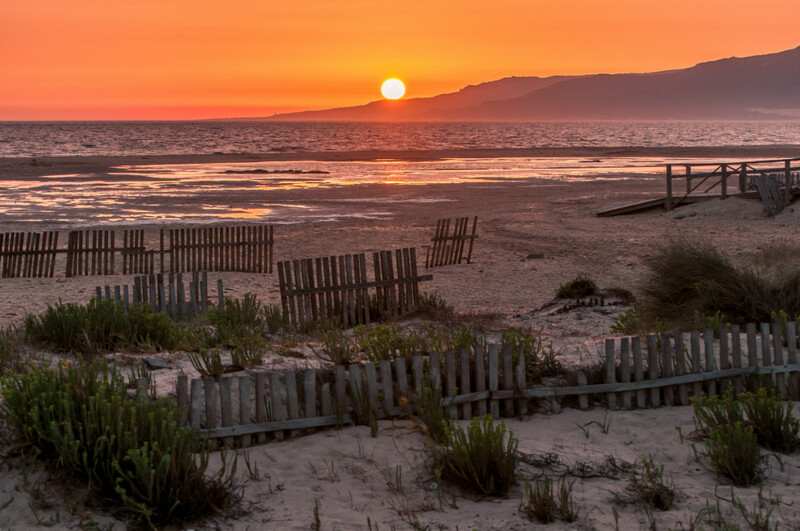 Tarifa is located in the very south of Spain where Africa’s mainland can be seen across the Strait of Gibraltar. 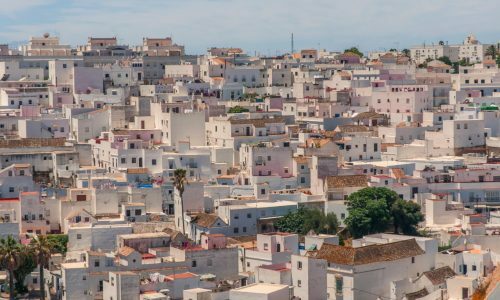 I have never been to Africa, and to see how close it is from Spain really put many things in perspective. 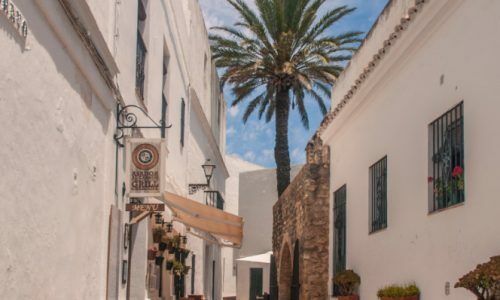 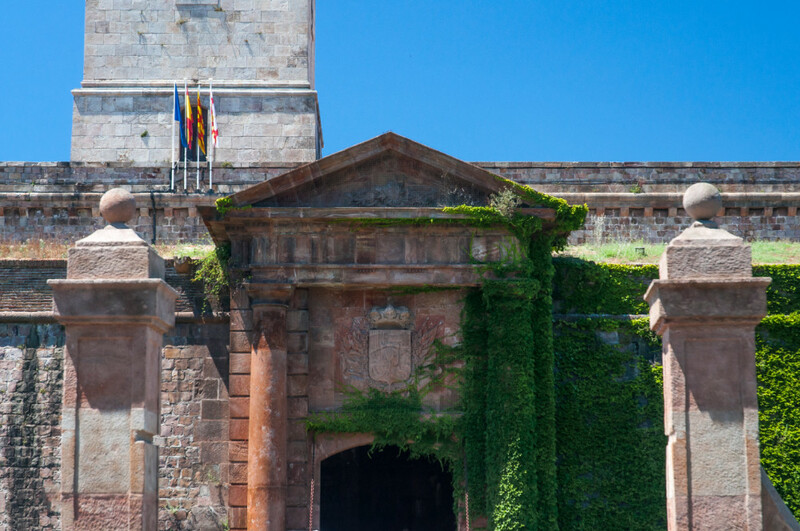 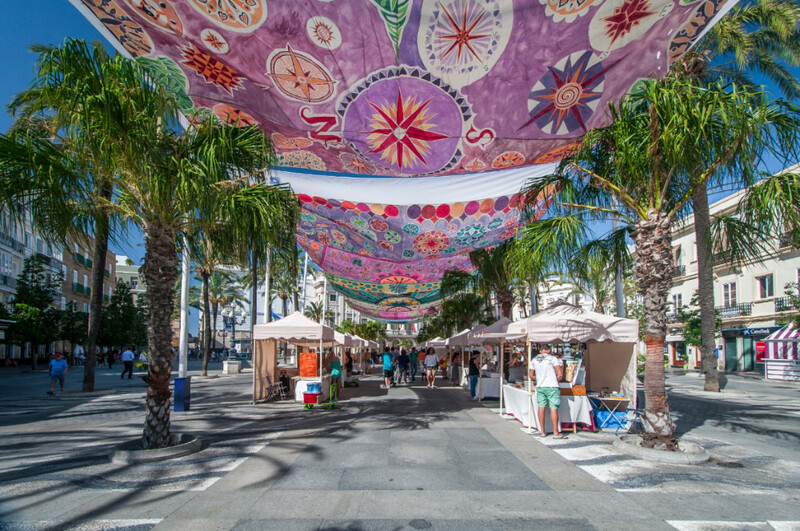 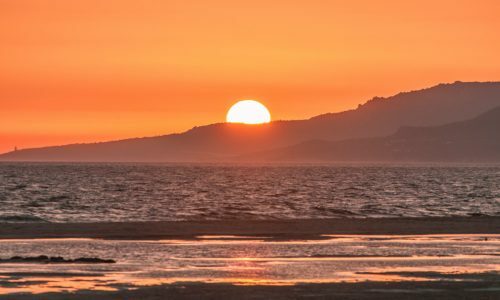 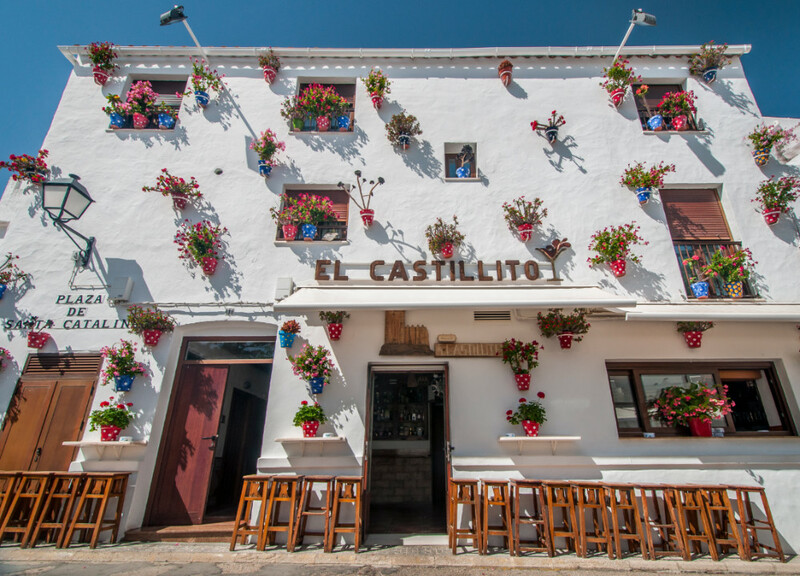 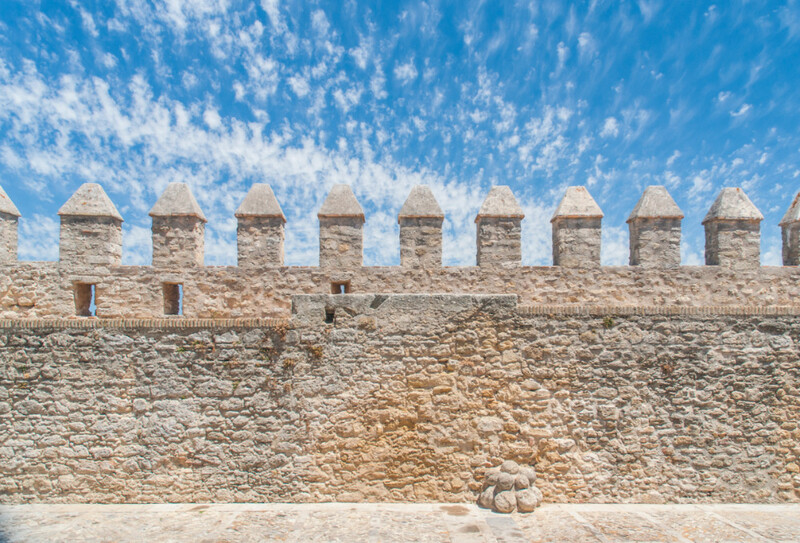 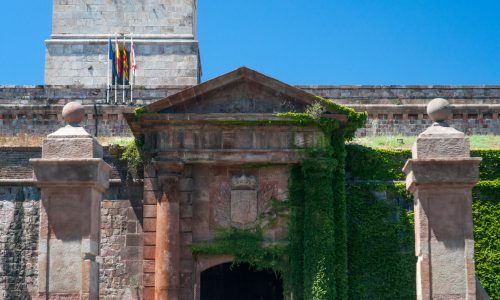 Tarifa has a beautiful old town to wander around and is a praised destination for kitesurfing as the winds are particularly strong in the area.